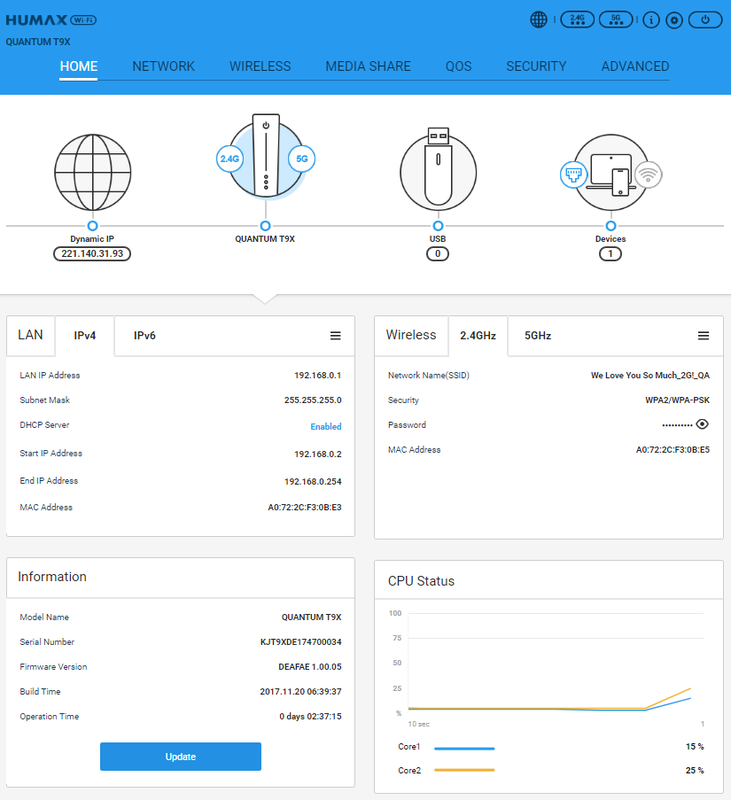 Excellent network performance that raises the bar for a Home Hub. With advanced Wi-Fi technology and Dual-Core & Hexa CPU for an uninterrupted and reliable network with quick speeds even when multiple devices are connected. It was made with the perfect harmony of performance and design. Rather than a common box design, the T9x stands like a tower to naturally blends in with any interior, whether in the living room, bedroom, study, etc. Performance is added to design for a powerful, high-performance Home Hub. As a dual band type router, both 2.4GHz and 5GHz wireless bandwidths are supported simultaneously. The 2.4GHz bandwidth covers the furthest corners of your home for web surfing, email, file sharing, and other general network functions. The 5GHz bandwidth is for online gaming, HD video streaming, and other functions when a buffer-free, high speed, and powerful networking performance is necessary. Smarter Wi-Fi packet transmission featuring MAC ON THE FLY architecture. Up to 128 devices connected simultaneously supported without a reduction in speed. 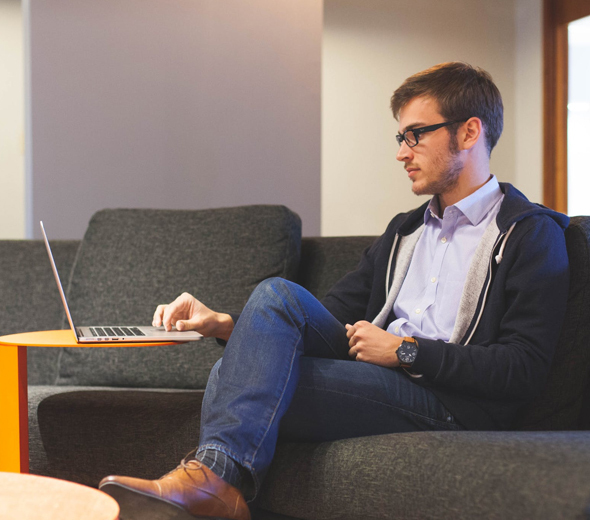 Upload and download speeds remain stable even in such extreme situations for reliable Wi-Fi connections at all times. Use the USB 3.0 port to build a personal network server. Connect a USB memory or hard disk to use as an NAS, utilize as a SAMBA or printer server, or build an FTP server to manage files remotely. 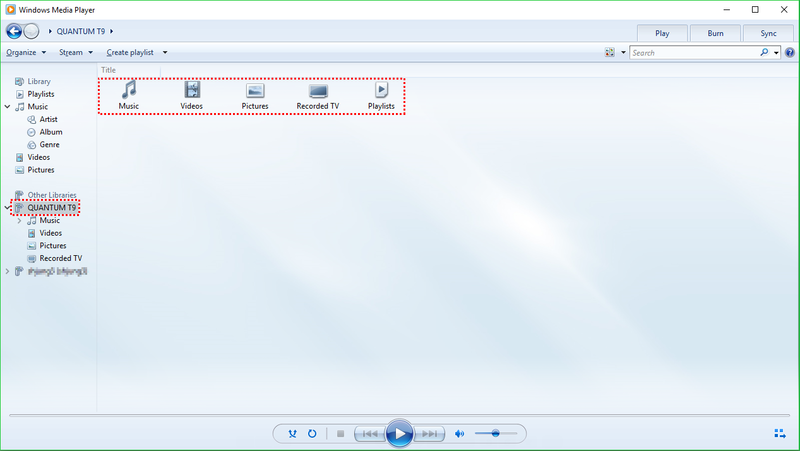 In addition, DLNA support allows unlimited sharing of pictures, videos, and other files between all multimedia devices connected to the network. Utilize the included torrent installation program to share files on USB storage devices.. Featuring LAN ports (for Entertainment and Data) with Gigabit performance and USB 3.0 ports to connect to a storage device for stable streaming service and gaming environment as a media server. 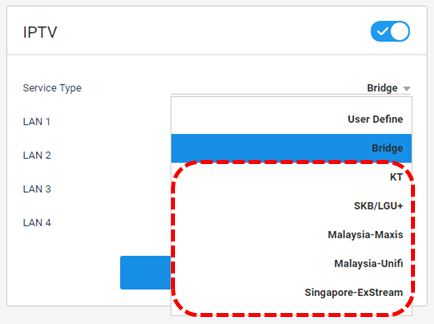 *Select IPTV function and ISP (KT, SKB, LGU+) in the Web UI after connecting IPTV to the entertainment port. **During the initial installation, remove the label above the power port before powering on. The USB 3.0 port is up to 10 times faster than a USB 2.0 port for maximum data transmission speed to read/write NTFS, exFAT, and other file systems. Connect a USB memory, an external hard drive, or other hardware to use as an NAS, FTP server, SAMBA, or printer server. 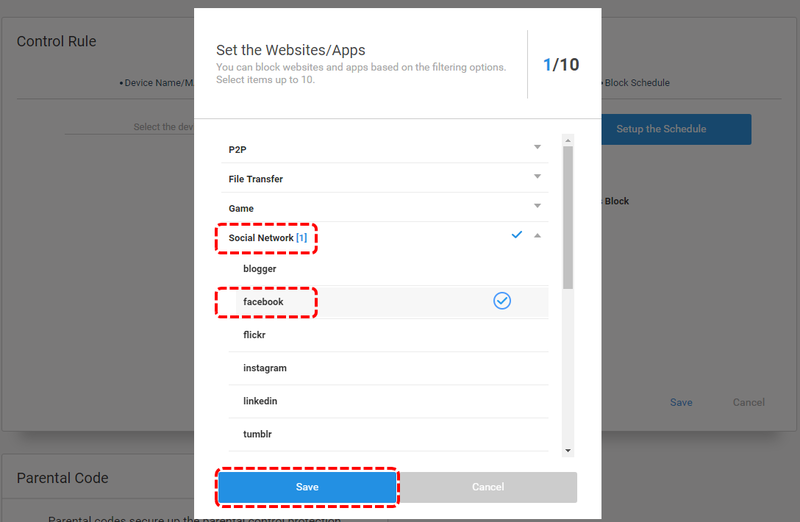 Use the SAMBA feature to share files with devices running on a different OS, and use the DLNA feature to share media files with all devices connected to the network. Make an FTP server to connect and manage files remotely. Utilize the internal torrent installation program to share files on USB storage devices. Connect remotely to share files anytime and anywhere. 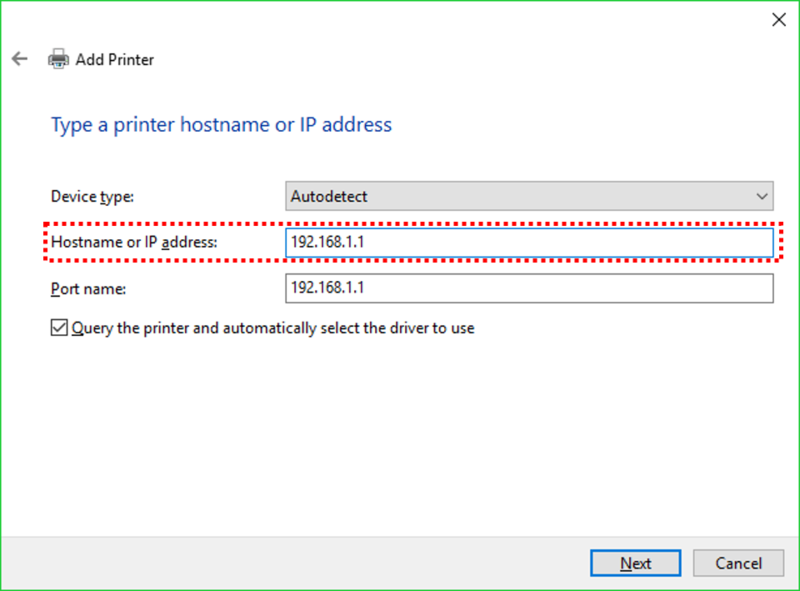 You can make a printer server by connecting your printer to the router. 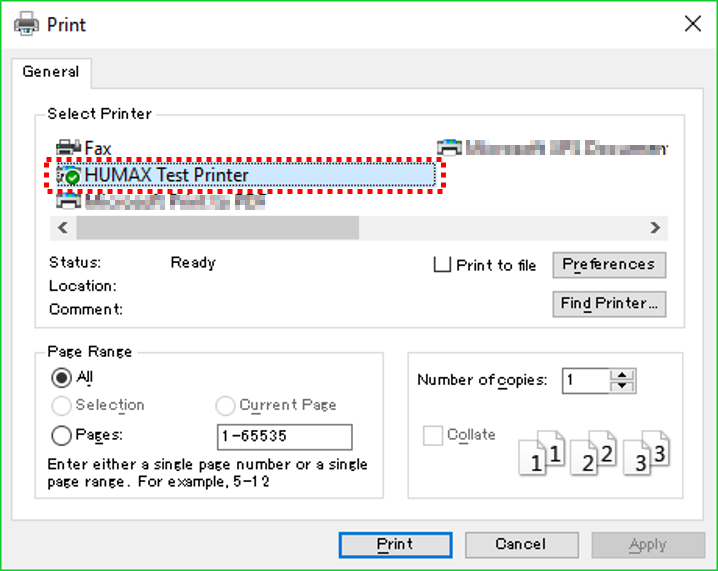 Regular printers can be connected to the network to become upgraded to a network printer accessible by all devices on the network and simply and easily configured through your preferred network-connected device. It boasts superior compatibility and supports and connects with all commercially sold printers. An Intel Dual-Core & HEXA CPU is featured for delay-free speeds and an optimized network environment. The 1.6GHz Dual-Core processor guarantees ultrahigh internet speeds as well as smooth multimedia streaming while minimizing network delays for uninterrupted gaming. Everyone connected to the network can experience fast, high speed internet connections with MU-MIMO technology that supports 4 simultaneous data streams for speeds up to 4 times faster than common AC routers, for all devices connected to the network. Beamforming technology senses devices receiving the antenna waves and focuses the wireless signals. This extends the wireless connection range while establishing a stable, reliable wireless network. The AnyClient Beamforming technology found on the HUMAX High Performance series is even applied to devices that do not support beamforming. Devices connected wirelessly to the router can enjoy a fast, worry-free, and reliable Wi-Fi connection with beamforming technology. *Beamforming technology is even applied to devices that do not support it. 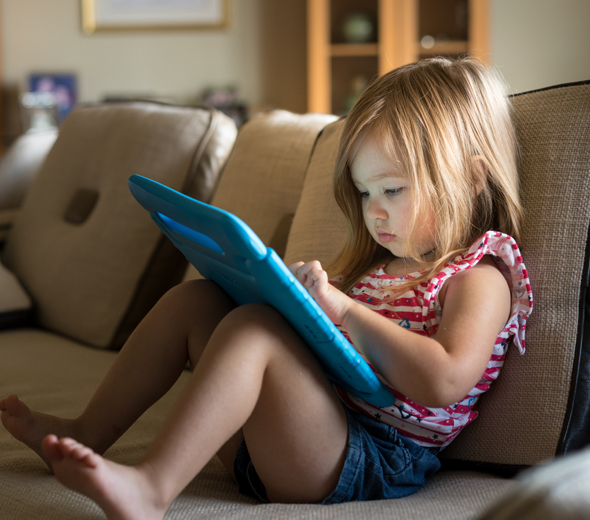 It features an enhanced parental controls based on a DPI engine with effective packet analysis that allows the blocking of services, not just devices. Specifically restrict selected websites, apps, and URL including particular keywords. Restrict internet usage outside of allowed time periods, and select services and restrict the access time even by publically used devices. It is possible to individually configure devices such as notebooks, smartphones, tablets, game consoles, etc.rds. HUMAX provides a complimentary DDNS (Dynamic Domain Name Serivce) service. Use a personal domain address to access your home network anytime and anywhere. Use the advanced configuration of Quality of Service (QoS) of network devices and applications to resolve traffic congestion and for faster speeds. When using applications in which speed is important, such as online games video streaming, configure the QoS to allow for more bandwidth and increase speeds. 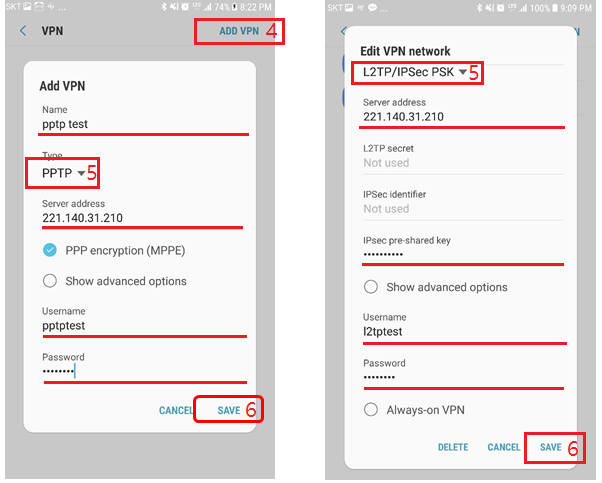 Support of PPTP, L2TP, and Open VPN allows safe remote access from distant locations. VPN client function is also supported. 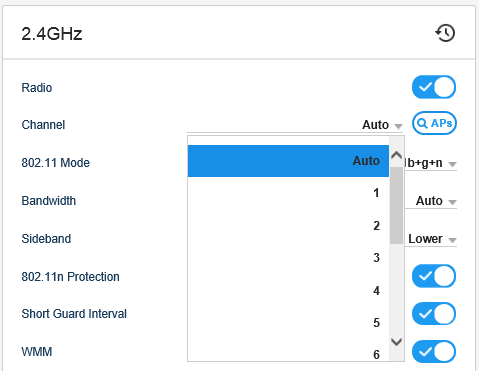 Create up to 7 guest networks for each of the 2.4GHz/5GHz bandwidths and establish security configurations for each network. Dual WAN feature is uses the Ethernet and USB ports for uninterrupted internet connections. 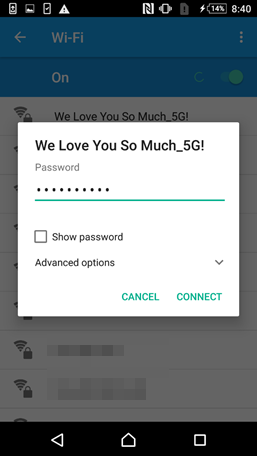 Use the 3G/LTE network of a mobile device for internet access by devices connected to the router even without a separate internet line. HUMAX developed a premium Web UI reflecting today’s trend to make configuring your router simpler and more intuitive. Simply click to freely configure your HUMAX T9x. Easily manage your home network via the HUMAX premium Web UI. You can manage your home network using a smartphone app anytime, anywhere. 1) CPU Offload, 2) Flexible packet transmission, 3) Multi client performance. AnyClient Beamforming - Ensure maximum Wi-Fi coverage to all of the 128 clients connected. • Dual core Hexa CPU with hardware accelerator for ultimate performance when downloading movies, playing games, and streaming 4K content. • MU-MIMO - Multiple devices to get high-bandwidth Wi-Fi signal at the same time. • AnyClient Beamforming - Ensure maximum Wi-Fi coverage to all of the 128 clients connected. • Intelligent QoS - Prioritize and customize any device and/or contents. 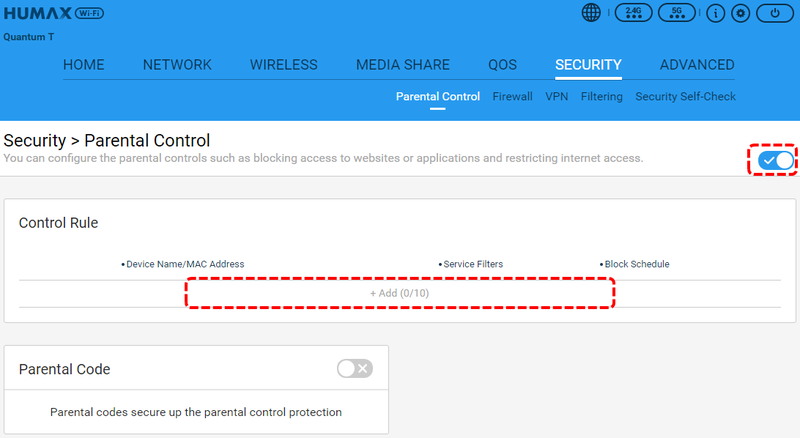 • Enhanced Parental Controls to select devices to manage contents(Website/Application level) and schedule settings. • Entertainment Port - Works as its optimal level to give you a super-smooth, uninterrupted streaming and gaming experience. • Efficient antenna layout design minimizes signal interference and maximizes wireless performance. • Built-in Print Server – Supports wireless printing from multiple computers. • Built-in Media Server – Allows users to play music, video and view photos. • Five (5) Gigabit Ethernet ports - Speeds can be up to 10 times faster than Fast Ethernet. 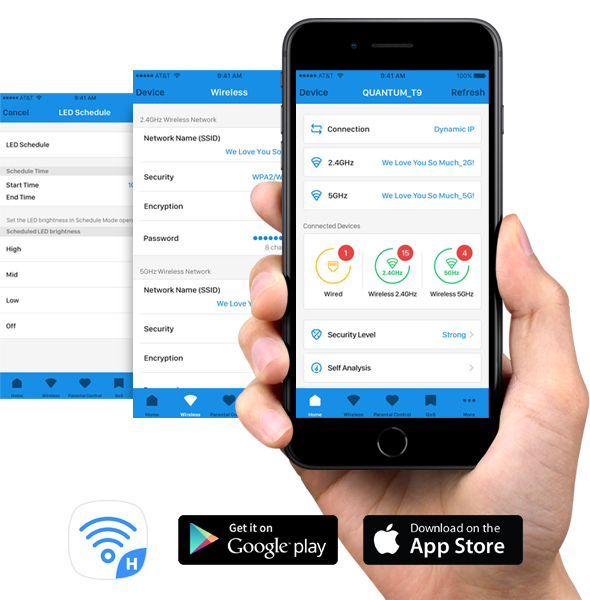 • HUMAX Wi-Fi® App - Allows easy network management at your fingertips. • VPN Server & Client - Secures remote access for privacy. • Easy Web UI - Ensures a quick installation, making your network setup out of hassle. • Easy Setup - Assistant with multi-language support provides quick & hassle-free installation. • Guest network Access - Provides separate Wi-Fi network for your guest. 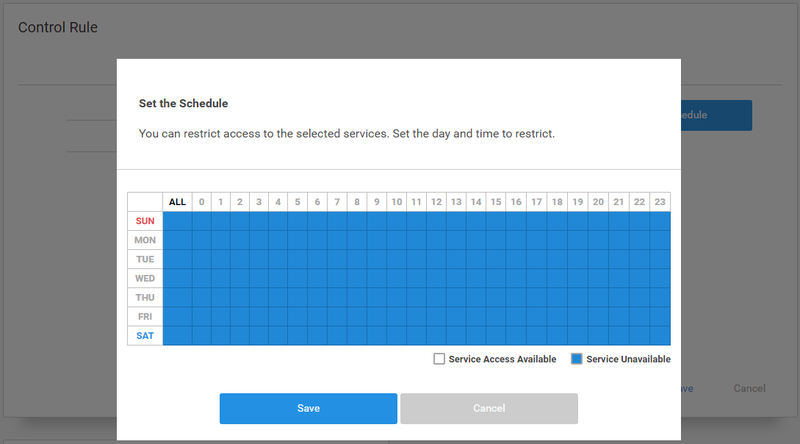 • Parental Controls to manage web filtering & accessibility by service or devices. 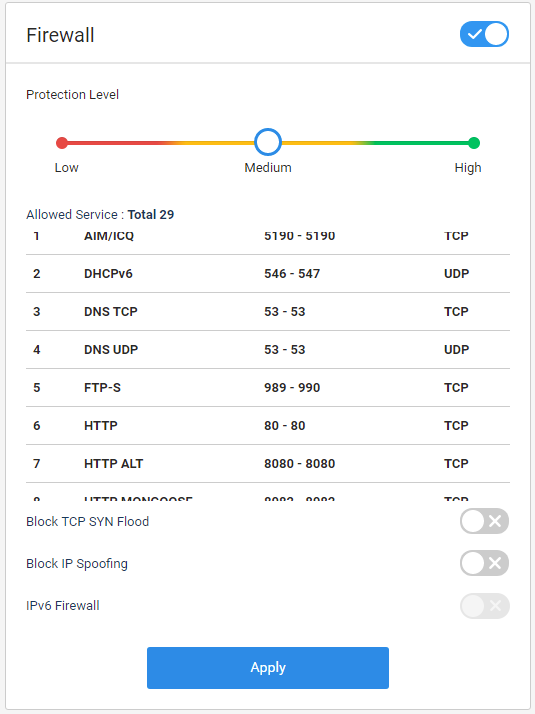 • Firewall protection - MAC/IP/Port/URL Filtering, Port forwarding, DMZ and more. Download the HUMAX Router User Manual by clicking on the link below. 2. 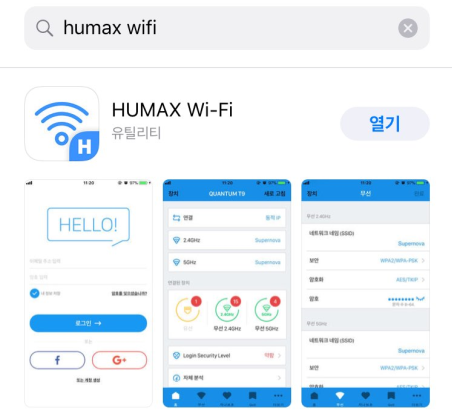 What is the ‘HUMAX Wi-Fi’ App? 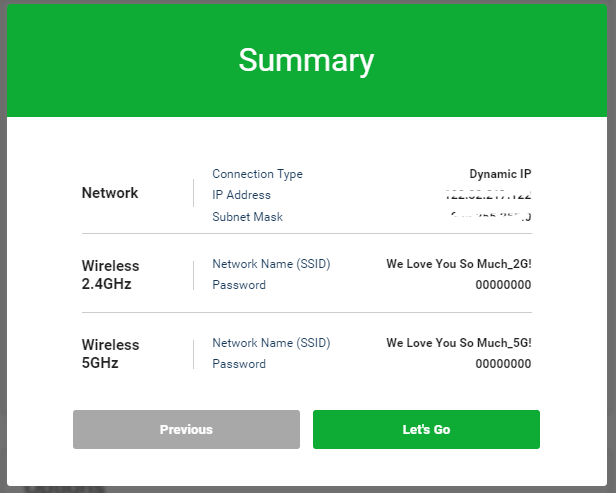 Download the free ‘HUMAX Wi-Fi’ mobile app to easily connect to your router, check on your internet connection status, configure the network connection (SSID) and password, set the parental controls, and more. Verify the status of the router LED lights located at the corners of the router. 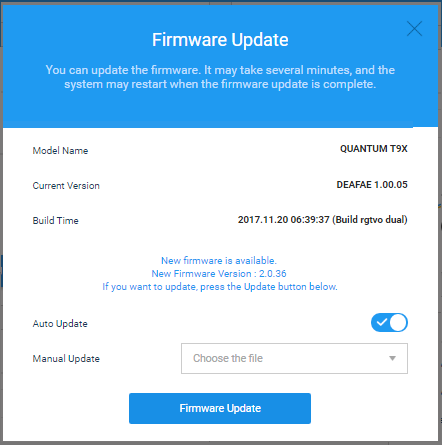 Use the following links to download the firmware updates. 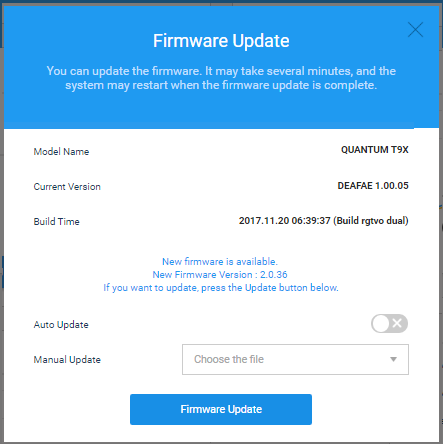 Click on the links below to verify the firmware version and how to update the firmware. Follow the steps to setup up your router. Connect the router to the ISP modem using the included LAN cable. 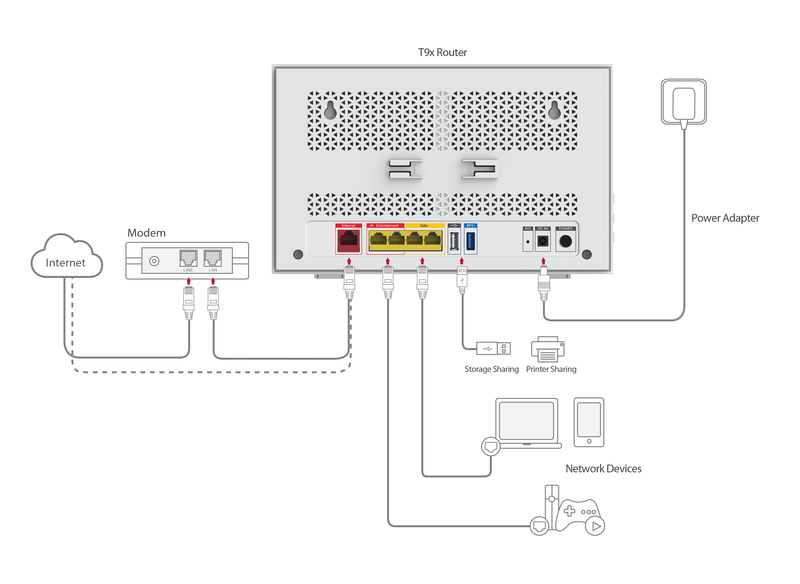 Connect the LAN cable to the red internet port (WAN). Plug into the router. Connect the included power adapter to the DC-IN port on the router. Now you can connect your preferred device to the internet by a wired (LAN cable) or wireless (Wi-Fi) connection. 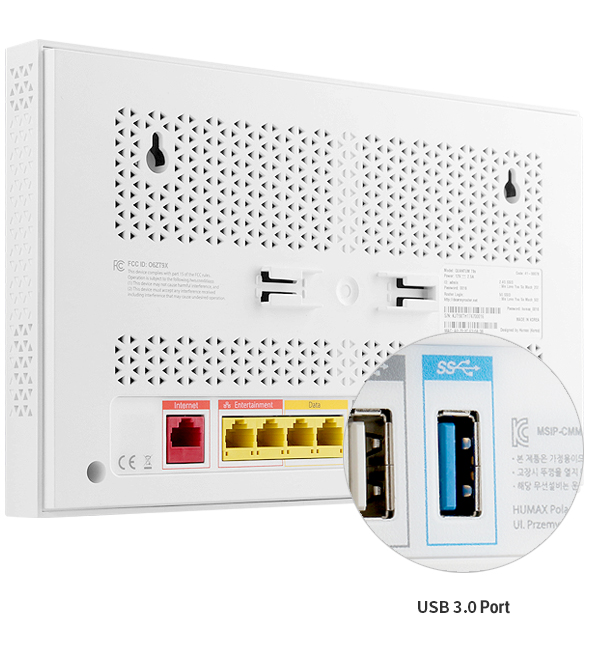 Connect to the router by connecting a LAN cable from the yellow LAN port to the device. 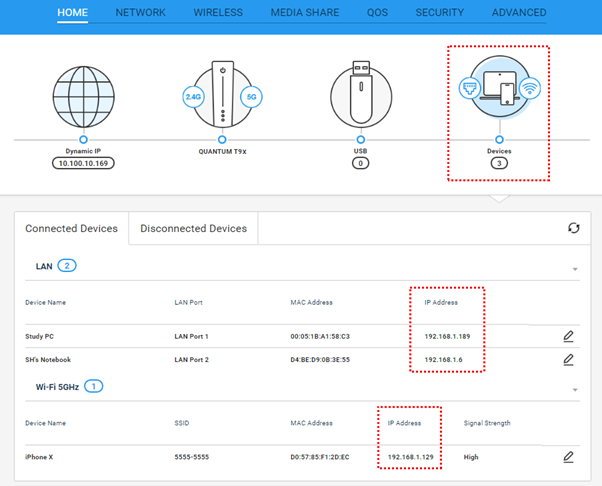 Connect the device by searching for and connecting to the proper network ID (SSID). Initial settings are found on the router label. 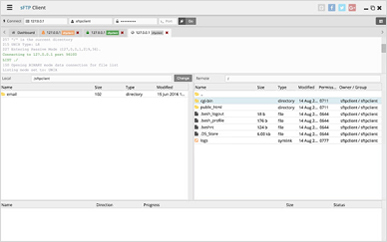 Begin the simple setup Wizard by connecting to the HUMAX Web UI. Use the welcome page to configure language and time zone settings. If choose to skip the easy setup, click on ‘Skip’ button on the bottom left. Depending on the network condition, the connection settings will be automatically adjusted. If the connection setting to be manual, input the proper information after selecting manual connection. 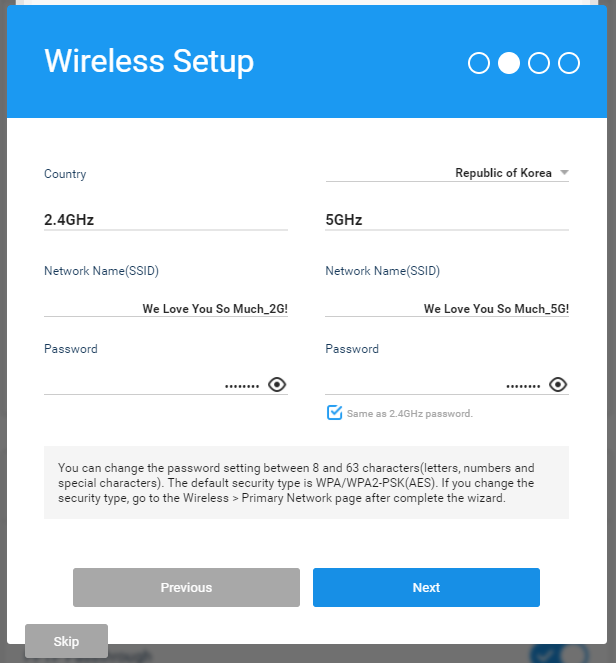 May select the country, network name (SSID), and passwords for each channel. Please check the router label for the default network names and passwords. May change the password to the router. We recommend changing the default password found on the router. Verify the router settings. Click on ‘Let’s Go’ to complete the setup and save the settings. If you skip the easy setup when first connecting to the HUMAX Web UI, go to Settings->Wizard to begin the setup process. [For Android] Note: The process may be different for your preferred Android version. Open the Play Store app on your device. Search for the HUMAX Wi-Fi app. Install the app first. Open the app after installation. 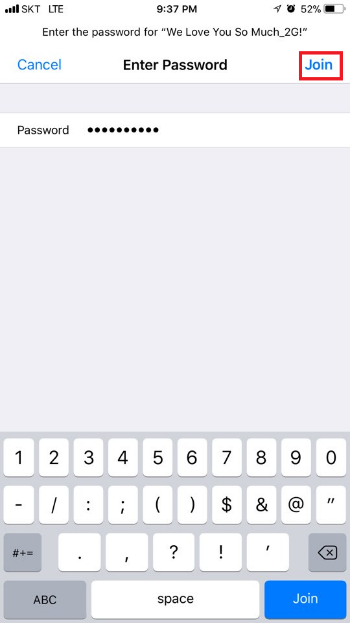 [For iOS] Note: The process may be different for your preferred iOS version. 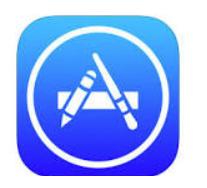 Open the App Store app on your device. Open the app after installation. 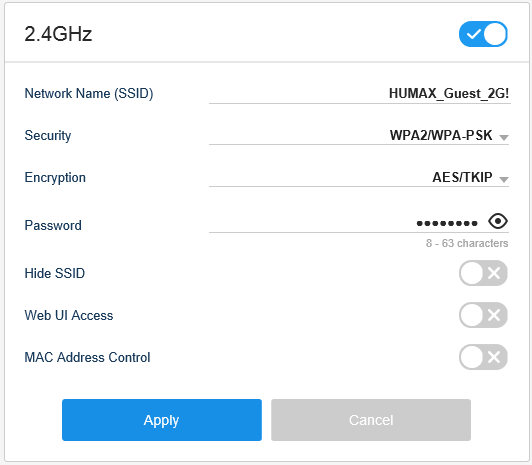 Begin easy configuration of the HUMAX router by connecting to the HUMAX Web UI (http://dearmyrouter.net) through your local network. Open your browser with a device that is connected either wirelessly or by a LAN cable to your router. 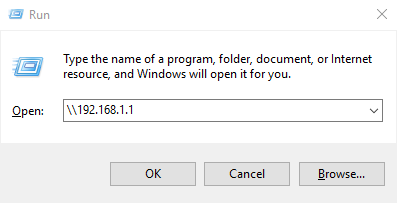 Note: The default address is 192.168.1.1. 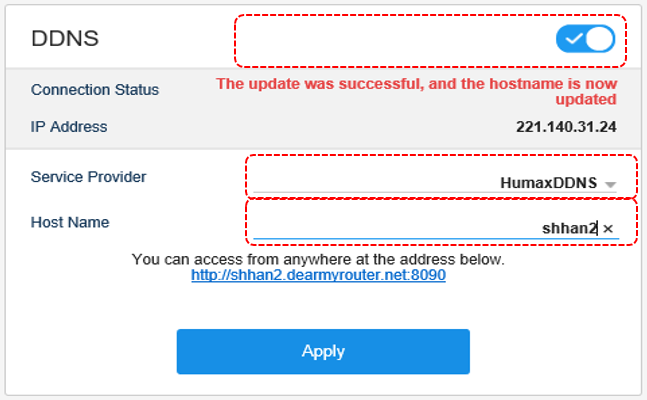 If you changed the address of the router, please use the new address. 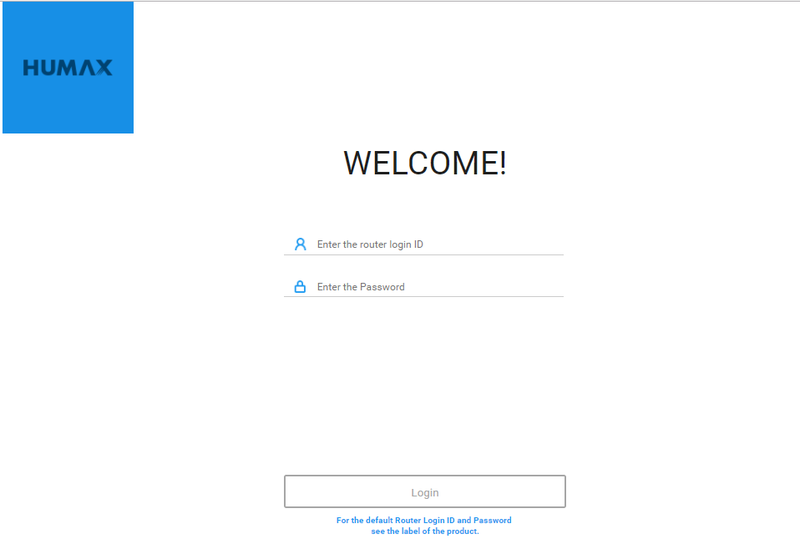 At the “Welcome Page,” enter your login ID and password to login and configure the router. Note: The default login ID is ‘admin’ and the password can be found on your router’s label. After login, may configure the router in Web Ui pages as depicted below. 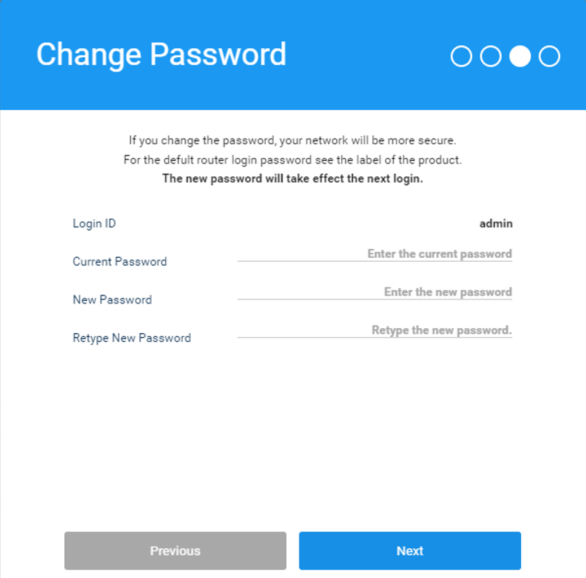 There are 3 ways to configure the network ID and password. 1. Click the following link to see how to use the Wizard. 2. 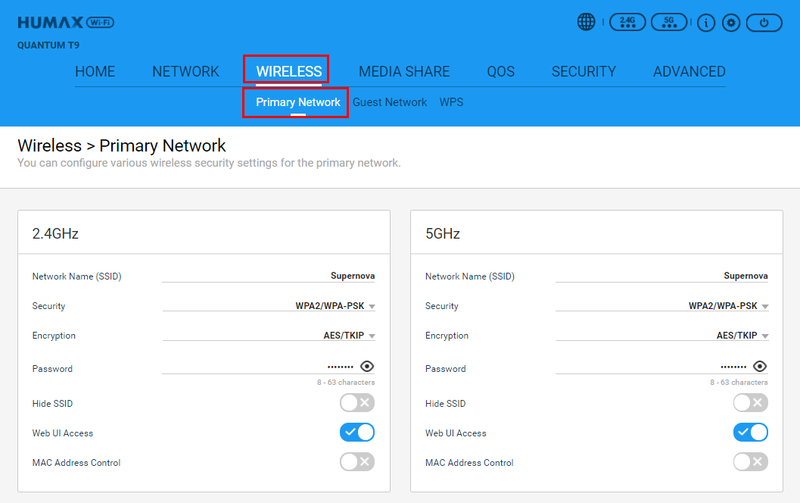 Go to Wireless >Primary Network to configure the network ID (SSID) and password for each channel. 3. 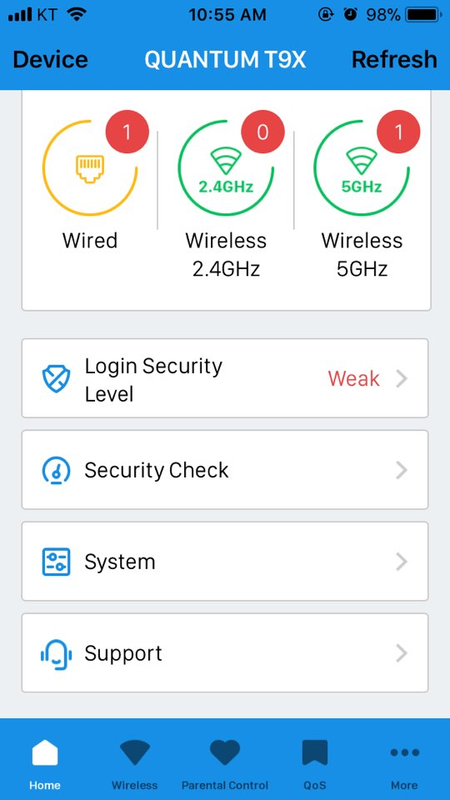 Use the ‘HUMAX Wi-Fi’ mobile app and go to ‘Wireless’ menu configure the network ID (SSID) and password for each channel. There are 2 ways to configure the network. 2. 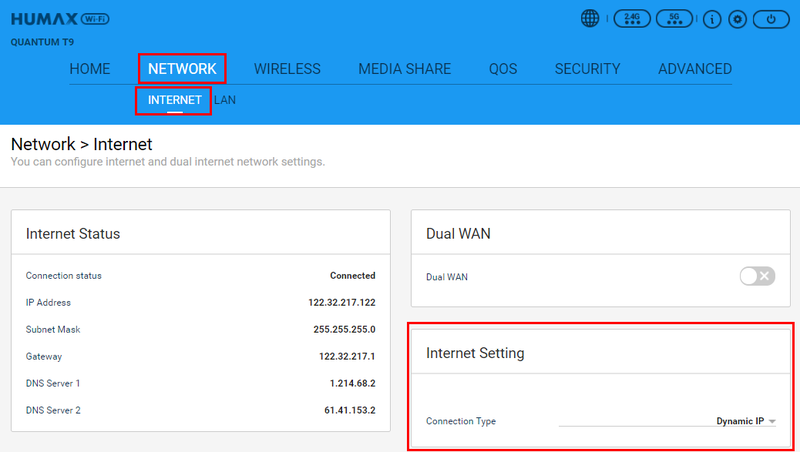 Go to Internet > Network to configure the network settings. Input your ISP information for static IP and PPoE connections. The following types of accounts are necessary to use your HUMAX High-performance router efficiently. 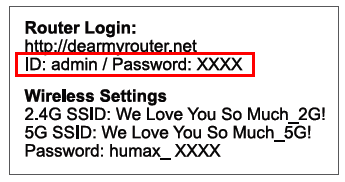 The login ID and password are necessary information to make changes to your router configuration after connecting to the HUMAX WEB UI (http://dearmyrouter.net). The default ID and password can be found on the label on your router. Note: For security reasons, we recommend changing the password after the first login. The default network name (SSID) and password are necessary information to access the internet and can be found on the label on your router. In order to use the HUMAX Wi-Fi app, you need to create an account and sign in. 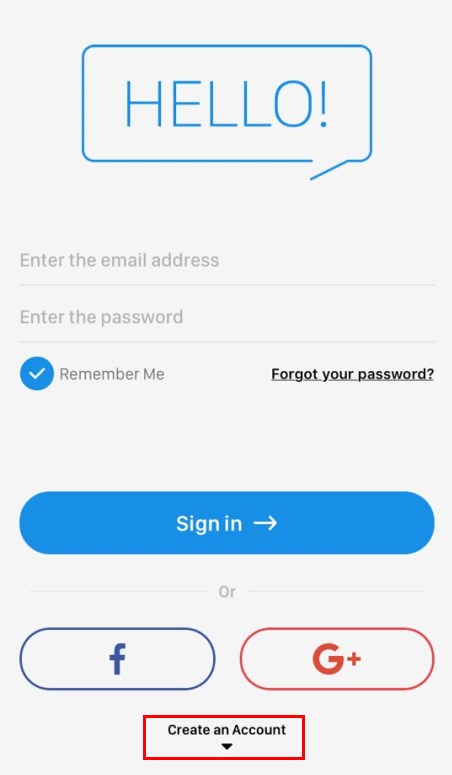 After opening the app, click ‘Create an Account’ to create a new account. HUMAX High-performance routers provide Parental Code setting feature for increased security for Parental Control. 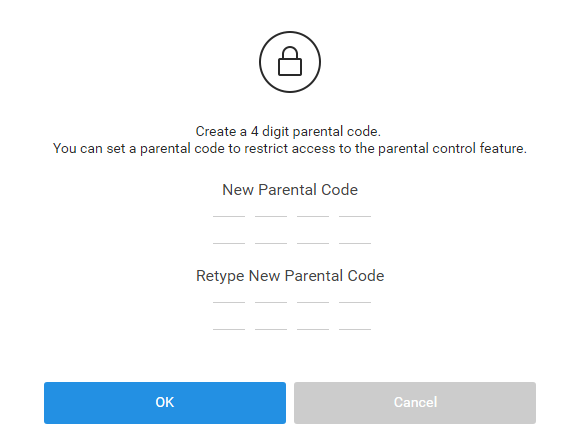 A four-digit code is the Parental Code used in accessing Parental Control. 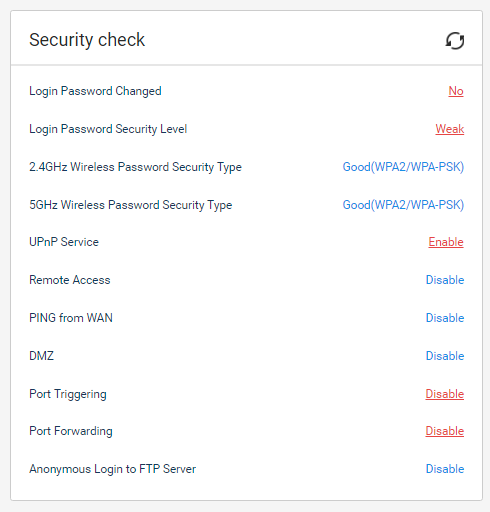 As the login password is used to access your router and configure it, we recommend changing the password after your first login to enhance the security of your router. 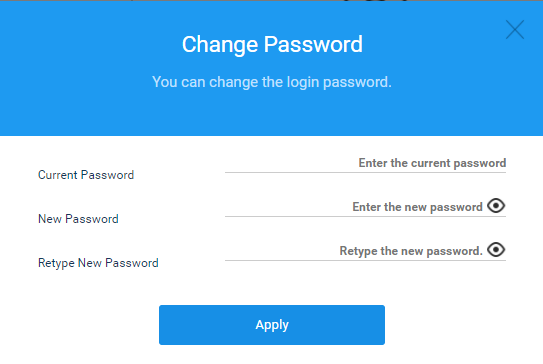 After the first login to the HUMAX WEB UI (http://dearmyrouter.net), go through each step in the setup Wizard until there is a ‘Change Password’ page where you can change the password. You can change the password by clicking the ‘Settings’ button, then clicking ‘Change Password’ from the menu, and changing the password on the ‘Change Password’ page. Step1. 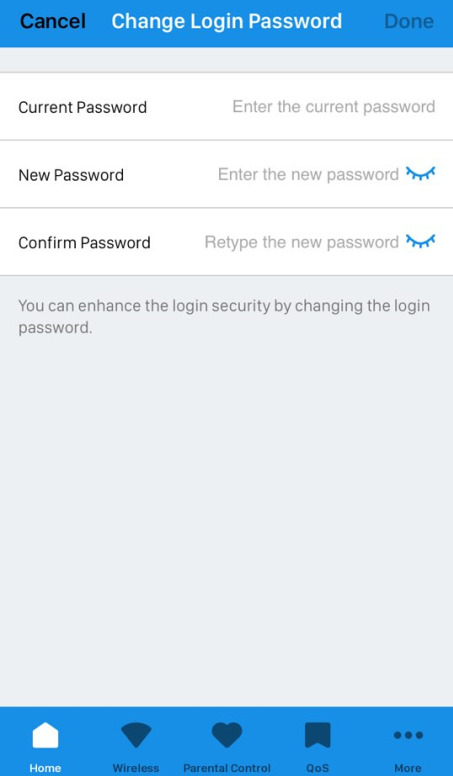 Open the app, login, and select Home > Login Security Level. Step 2. Change the password. Press and hold the Reset button found at the back of the HUMAX router for more than 5 seconds. After router reboots, the router will return to default settings, including the default ID and Password. Find the default ID and password on the label on the router. The HUMAX router has an automatic channel select feature that finds and selects the best channel. Note: The default settings of the router are set to select (Enable) the optimum channel. 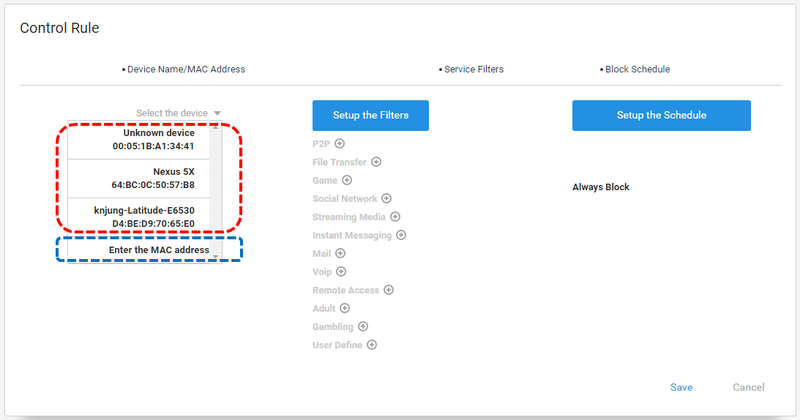 The automatic channel select feature enables HUMAX router to search and check the available channels nearby and select the best channel after evaluating each channel. 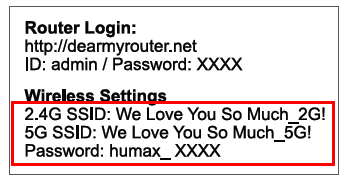 Use your PC or smartphone to connect to the HUMAX WEB UI by opening your browser and typing http://dearmyrouter.net or http://192.168.1 in the address window of your browser. Click on the ‘Wireless’ button in the ‘Advanced’ menu. Select ‘Auto’ for the 2.4GHz channel. Note: Configuring the 5GHz channel is similar to configuring the 2.4GHz channel. The HUMAX router can be connected with devices with various operating systems. Note: The process may be different for your preferred Windows version. 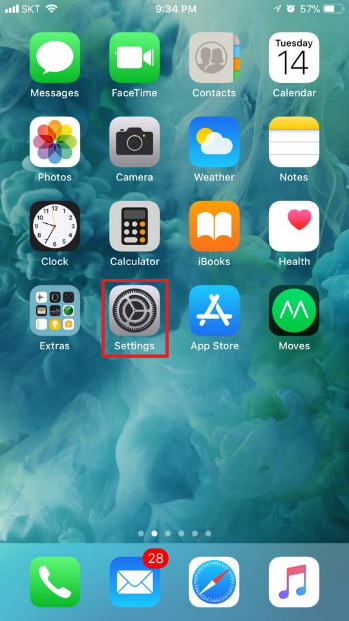 Click on the Wi-Fi icon found at the lower right corner of the screen. Note: The process may be different for your preferred MacOS version. 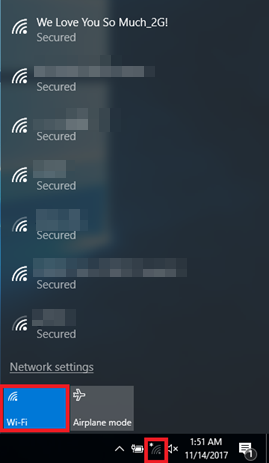 Click on the Wi-Fi icon found at the top of the screen and click on the selected SSID. 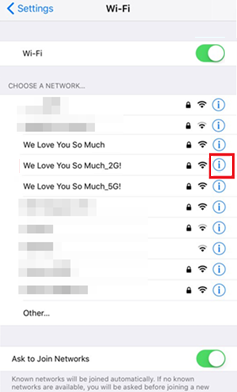 The Wi-Fi icon below will appear after connected. Note: The process may be different for your preferred iOS version. 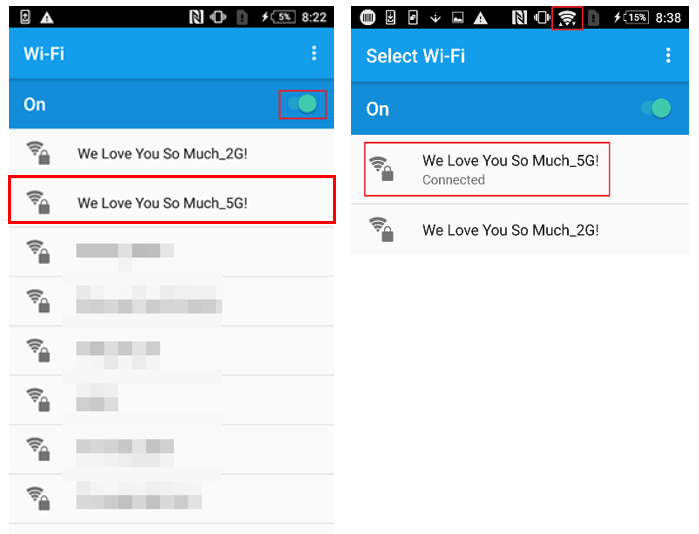 Open ‘Settings’ and then open ‘Wi-Fi,’ and enable Wi-Fi. 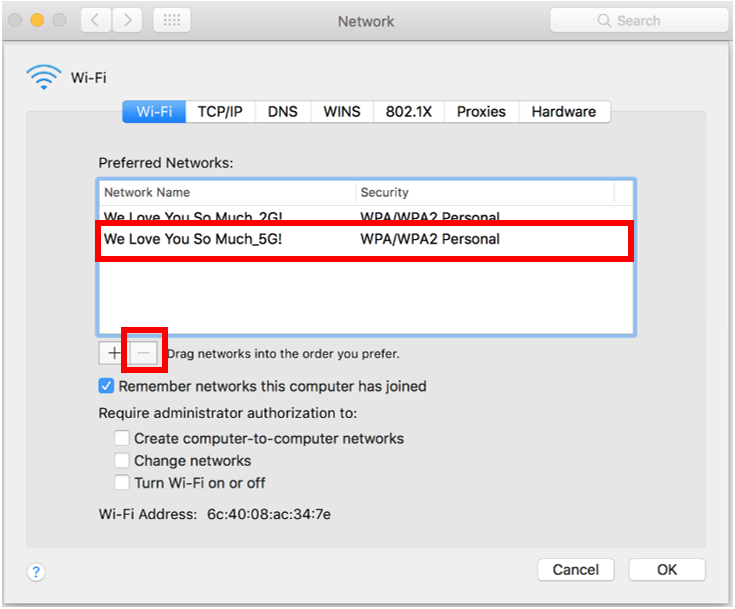 Select the SSID on Wi-Fi select page. Note: The process may be different for your preferred Android version. Open Settings, go to Wi-Fi, and enable Wi-Fi. 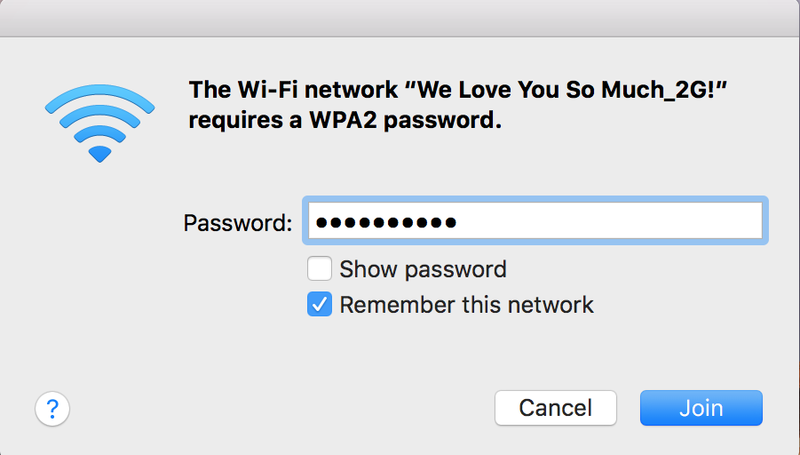 Type the Wi-Fi password and click ‘Connect. 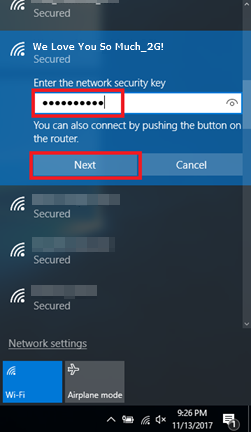 In the event the wireless is not connected, or if the password has been changed, delete the existing wireless profile and then try to re-connect. 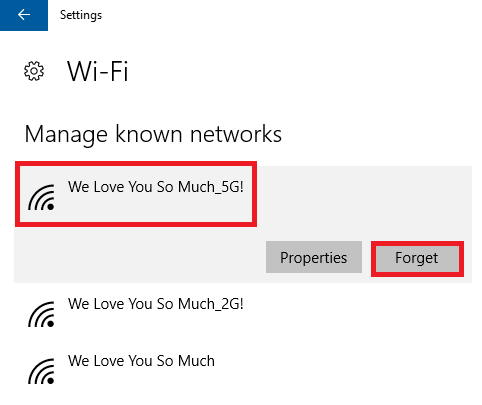 Click on the saved SSID and click ‘-’ to delete. 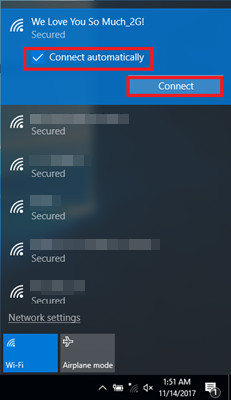 Open ‘Settings’ and then open ‘Wi-Fi.’ Touch the information icon of the selected SSID wish to delete and then touch ‘Forget this network’ on the next page. 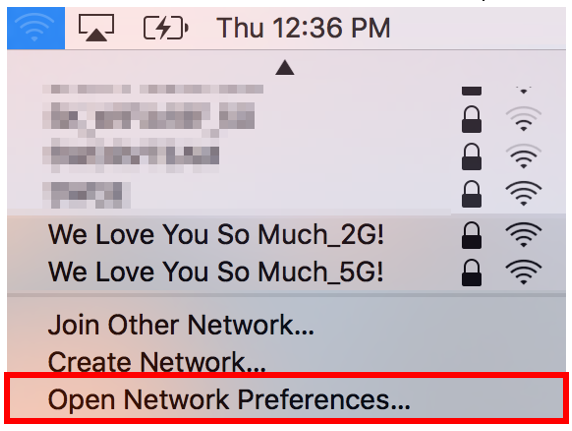 Open ‘Settings’ and then open ‘Wi-Fi.’ Select and touch the SSID wish to delete for a few seconds and then touch ‘Forget network’ on the next page. IEEE 802.11ac is a wireless network standard that provides high-throughput on the 5GHz band supporting up to 433.33Mbps data rate per antenna (spatial stream). IEEE 802.11n is a wireless network standard that provides network throughput on the 2.4GHz supporting up to 150Mbps data rate per antenna (spatial stream). HUMAX routers are automatically configured to continuously select the optimal rate for wireless communication between the router and device depending on the surrounding environmental conditions such as distance, wireless signal strength, wireless signal noise, etc. The device may show speeds that are not the fastest rate but the optimal rate. 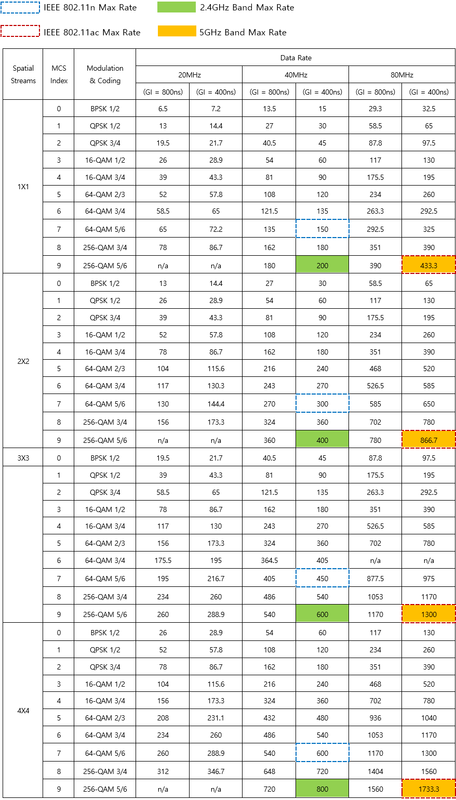 The table below shows the speeds of IEEE 802.11ac and IEEE 802.11n networks. 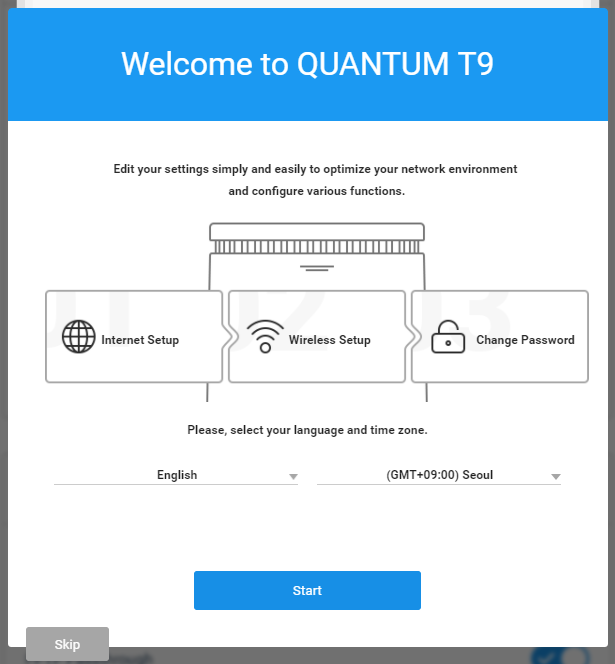 The different network Wi-Fi standards are applied to each Quantum T Series model as follows. The HUMAX router has a Guest Network feature that allows you to have multiple wireless network names (SSID). 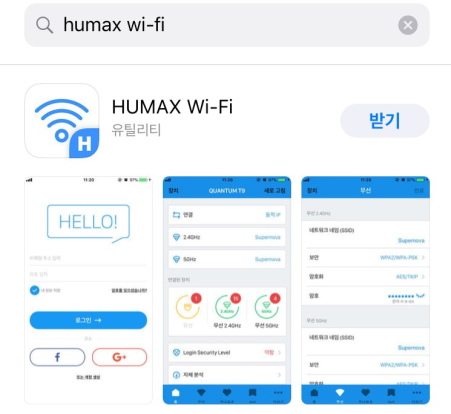 Open the browser of your preferred wireless device (Smart Phone, PC etc) and connect to the HUMAX WEB UI http://dearmyrouter.net or http://192.168.1.1. The HUMAX router automatically provides default settings for Guest Network which requires no modification. After setting, click ‘Apply’ to complete the process. The WPS (Wi-Fi Protected Setup) feature allows you to easily add wireless devices to the network. 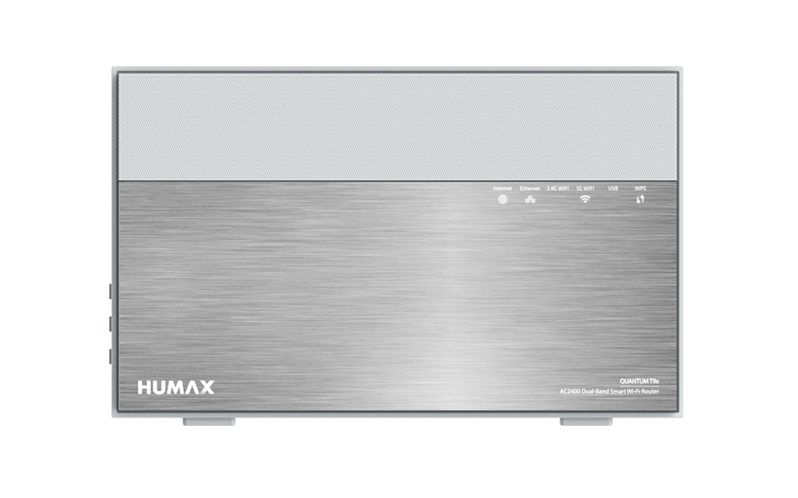 Presently, the HUMAX router has a physical WPS button, but the feature may also be accessed through the HUMAX WEB UI. - The wireless adapter of the connecting device is off. - The ‘Hide SSID’ feature on your router is turned on. - The security setting is configured for WPA2-Enterprise, WPA2/WPA-Enterprise, and WEP protocols. Push the red WPS button found on the top of your router. Note: It may take up to 2 minutes after pushing the button for the WPS feature to function. After 2 minutes, the WPS feature closes. While the WPS function is being accessed, the LED will blink in white. Push the WPS button on the device to connect with. Blinking will stop after successfully connected. Open the browser of your preferred device and type http://dearmyrouter.net or http://192.168.1.1 in the address window. 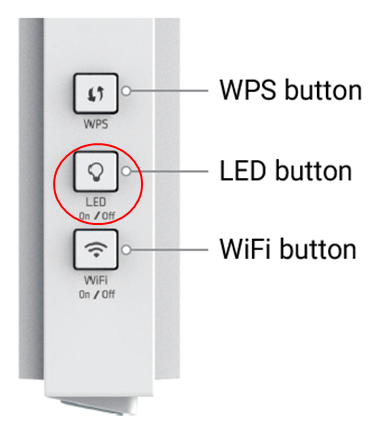 Click the ‘WPS Button’ and then click the WPS button of the device you are connecting with. 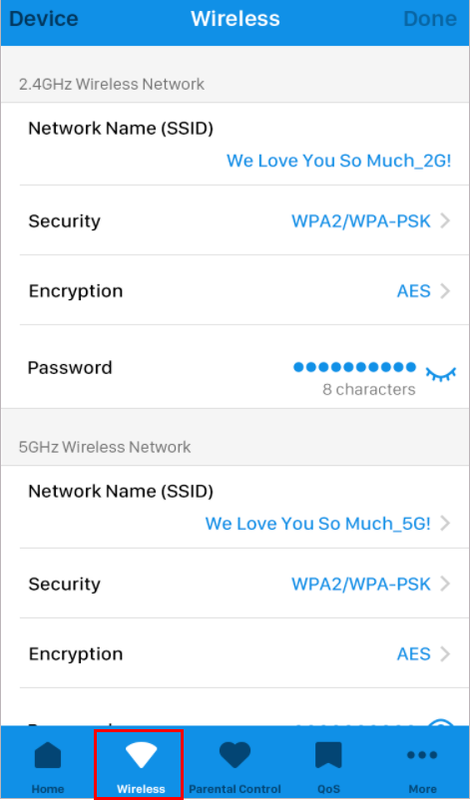 When the devices have connected successfully, the following page will appear to show that your device successfully connected to either the 2.4GHz or 5GHz network SSID. 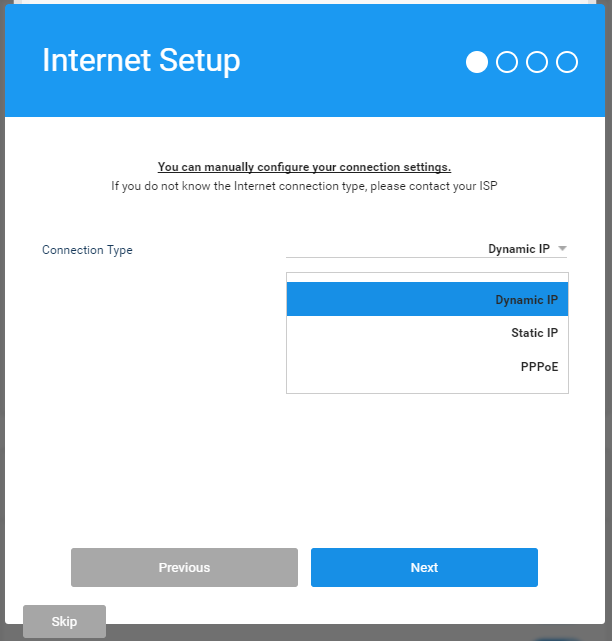 When your router has connected successfully by WSP, the following page will appear to show that your device successfully connected. Open the browser of your preferred device (PC or Smart Phone) and type http://dearmyrouter.net or http://192.168.1.1 in the address window. If the wireless feature is disabled, click to enable. Note: The way to enable the wireless feature is the same for both the 2.4GHz and 5GHz channels. 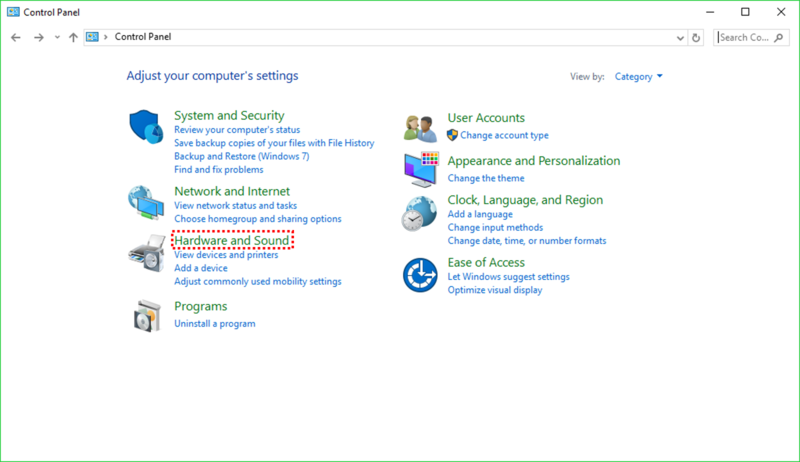 Disable ‘Hide SSD’ if configured to be enabled. Note: The way to disable the ‘Hide SSD’ feature is the same for both the 2.4GHz and 5GHz channels. The HUMAX router allows you to connect a USB memory or external hard disk drive to use as a file server. Note: Some external hard disk drives may not be compatible. Connect the USB memory or external hard disk drive to the HUMAX router. If the USB memory or external hard disk is recognized, your will see the following page that will show the memory or hard disk information. Click the ‘Folder Path’ menu and select the folder to share. 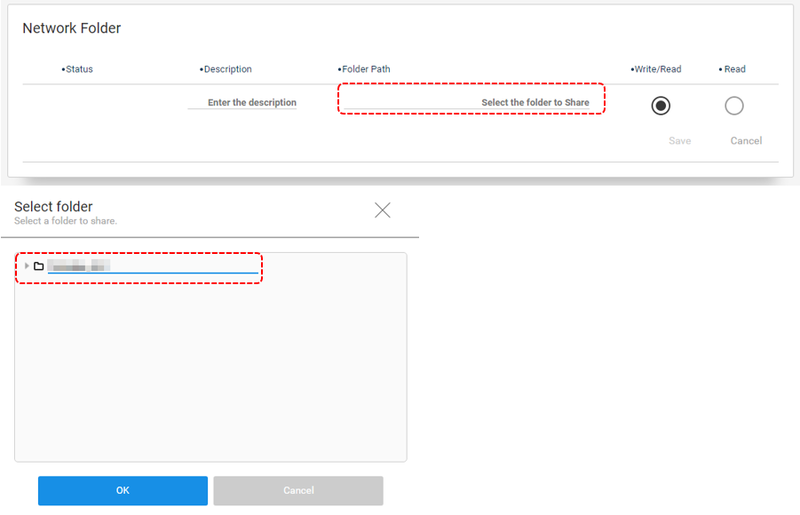 After selecting the folder, type a description regarding the folder to connect it the account when configuring the File Server. 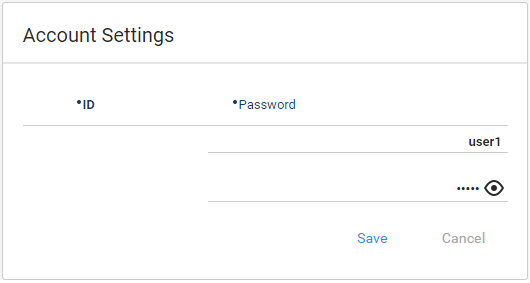 Configure the account and setup password in the ‘Account Settings.’ This account will the account used when accessing the file server supplied by Quantum. The HUMAX router acts as a file server in your home. Your files can be accessed through HUMAX routher at the office or when out of the house. Note: In order to use the FTP Server function, a USB memory or external hard drive must be connected to the HUMAX router. Click to enable FTP Server and select the account name and the description of the shared folder to access. You can make an account when configuring the USB. 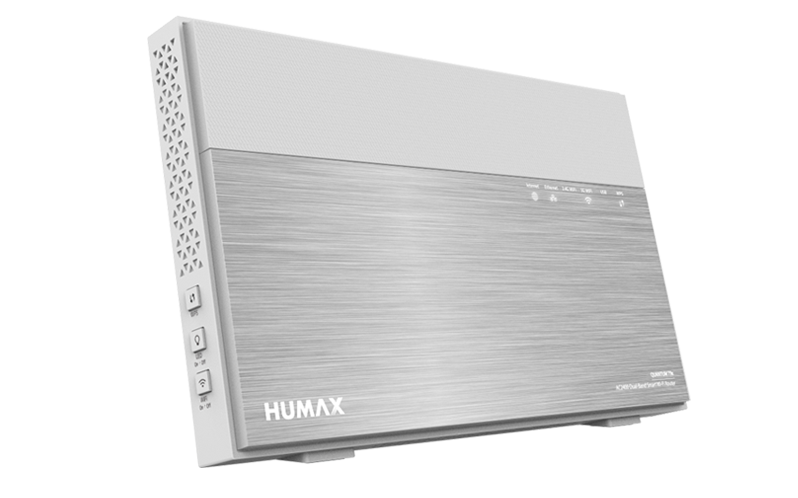 Link with DDNS to access the HUMAX router file server from the office or when out of the house. Type ftp://router_ip_address or ftp://ddns_domain to login to your account and access the file server. Click the Windows Explorer or type WINDOWS + E and type ftp://router_ip_address or ftp://ddns_domain to login to your account and access the file server. The HUMAX router allows you to connect a USB device to use as a media server. You can share music, picture, video, and other files in the USB device with any device connected to the HUMAX router. Note: In order to use the Media Server function, a USB device with media files must be connected to the HUMAX router. 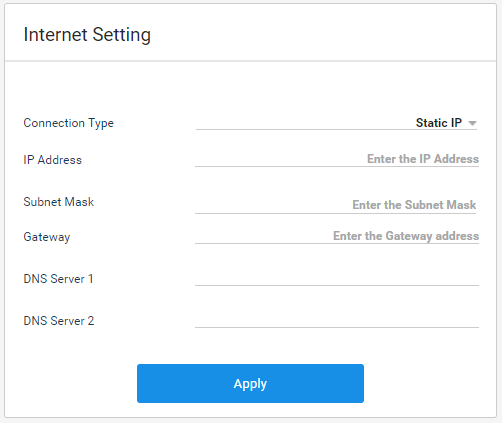 How to Connect to the Media Server of the HUMAX Router? Run the file sharing program or app on your preferred devices connected to the HUMAX router. Select the name of the media server on the HUMAX router and access the files. Note: The process may be different for your preferred program/app. The HUMAX router has a SAMBA server feature that allows you to share files between devices with a different OS. Note: In order to use the SAMBA Server function, a USB device must be connected to the HUMAX router. 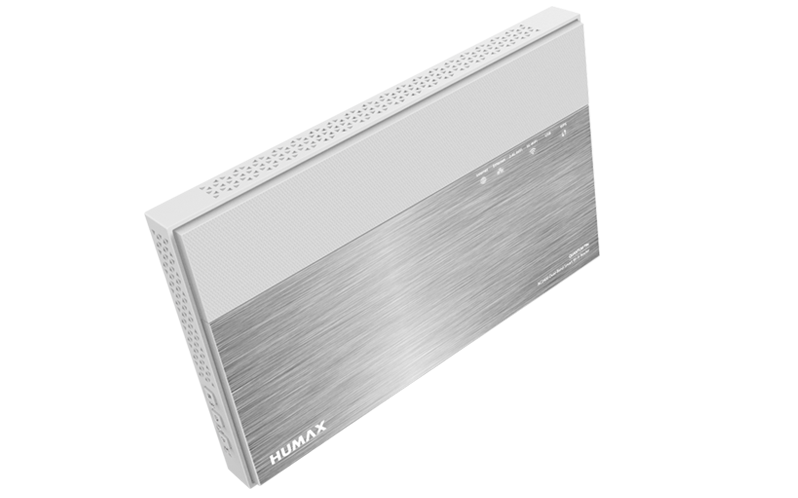 After verifying that the USB device is properly connected to the HUMAX router as shown below, click ‘Add’ in the ‘Network Folder’ page. Note: Long folder names (i.e., Folder Path) may not be supported. Note: You can choose only ‘Write/Read’ or ‘Read’ for the folder when accessing by SAMBA or FTP. 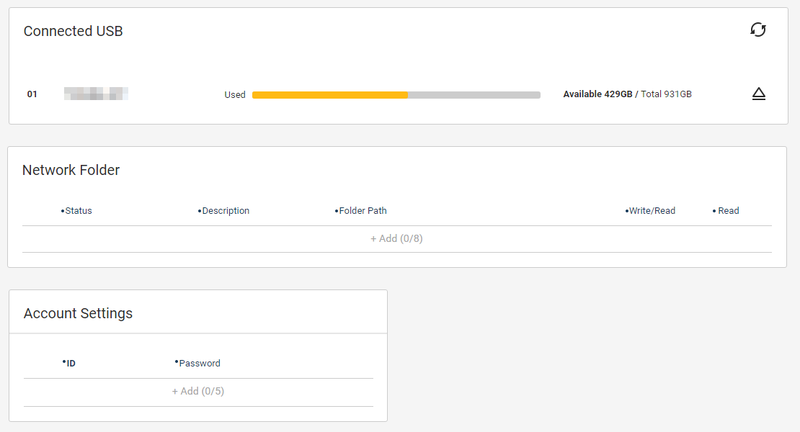 After configuring the network folder, click ‘Apply’ and verify the information. Your Network Folder selection is completed now. Configure the account to access SAMBA. The account will be used for FTP and SAMBA access. Click “Add” first. Enter your preferred ID name and password. Click the eye icon to see the password. Note: Names such as admin, root, anonymous may not be used (regardless of capitalization). 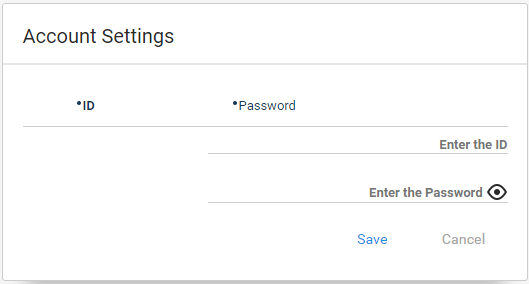 Click ‘Save’ after entering the ID and password. Click ‘Apply’ to complete the process. ※ Note: Click ‘Apply’ to complete the account setting process. The account setting process is completed now. As depicted below, enable the Windows Network (Samba). 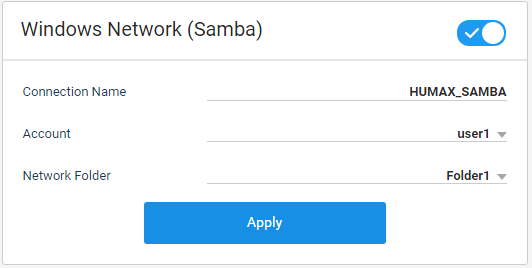 In the SAMBA window, select the connection name and the account and network name previously made. 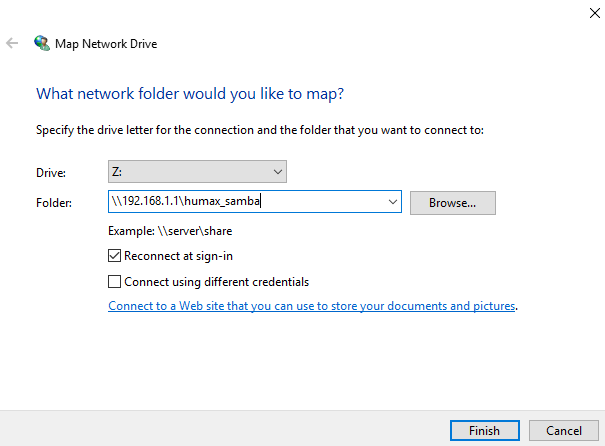 If the user is accessing SAMBA on a PC, the connection name is HUMAX_SAMBA. 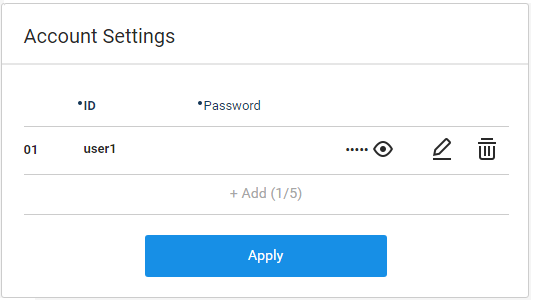 Note: If you select ‘Anonymous’ as the account to connect to SAMBA, there is no need to input an ID or password (possible security risk). Click ‘Apply’ to complete the process. There are 2 ways to connect to SAMBA locally. Click ‘OK’ and a Windows Explorer window will open. The ‘humax_samba’ icon as configured in the HUMAX WEB UI will appear. 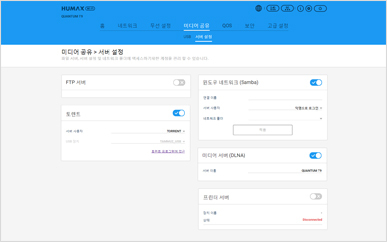 Double-click the ‘humax_samba’ icon and a login popup window will appear. Type in the SAMBA account as configured. Note: If ‘Anonymous’ was configured in the account, the pop-up window may not appear but connect immediately. Connection will be made after completing the log-in process. Double-click the ‘My PC’ icon. Find the ‘Map network drive’ icon, as in the upper left part of the diagram below. You can access SAMBA after logging in. The HUMAX router allows you to connect a USB printer to use as a network printer. 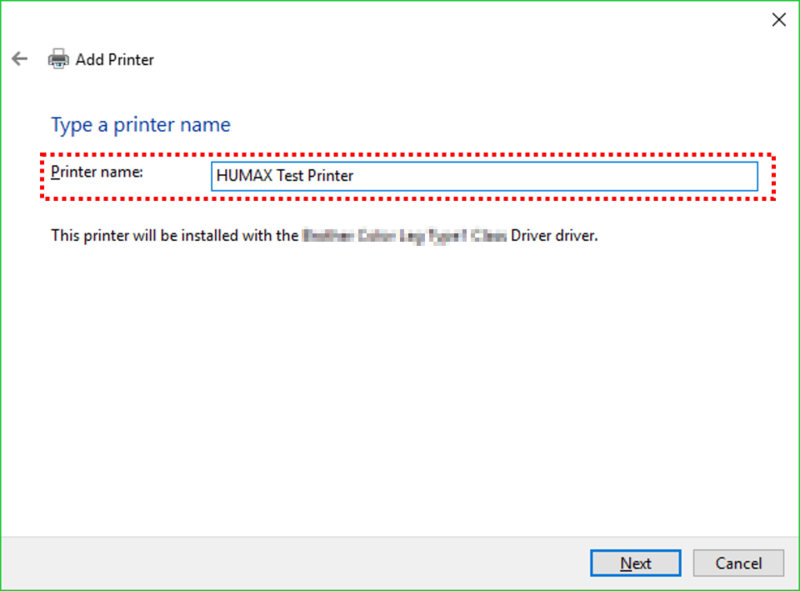 Connect the printer to the USB port and check the page to verify that the printer is recognized. If the page is not updated, press F5 or click ‘Refresh’ to refresh the page. 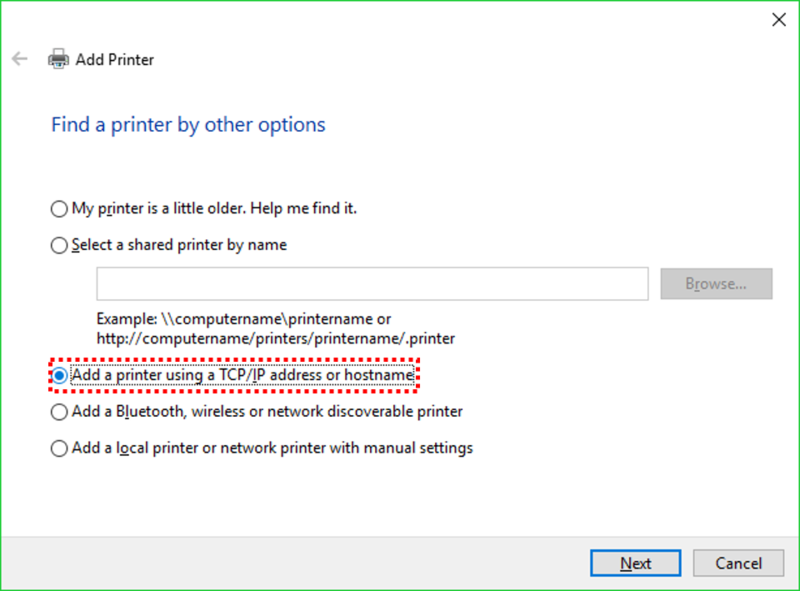 How to Setup Network Printer. 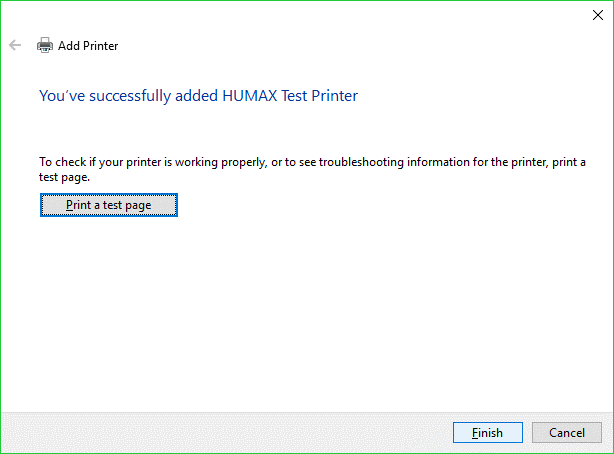 Add the printer to your PC (Windows 8.1 shown below) connected to HUMAX router. 7)	Enter your preferred printer name. 9)	The printer is added. 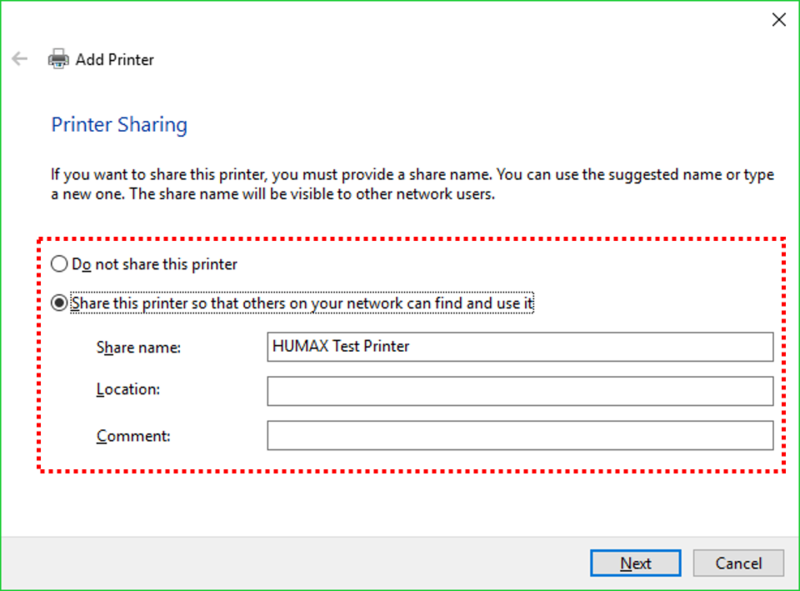 You can use the network printer through your preferred devices connected to HUMAX router now. The HUMAX router allows you to automatically configure program ports to access games, Windows Live Messenger, Skype, Torrent, etc. and other peer-to-peer (P2P) programs using Universal Plug and Play (UPnP). 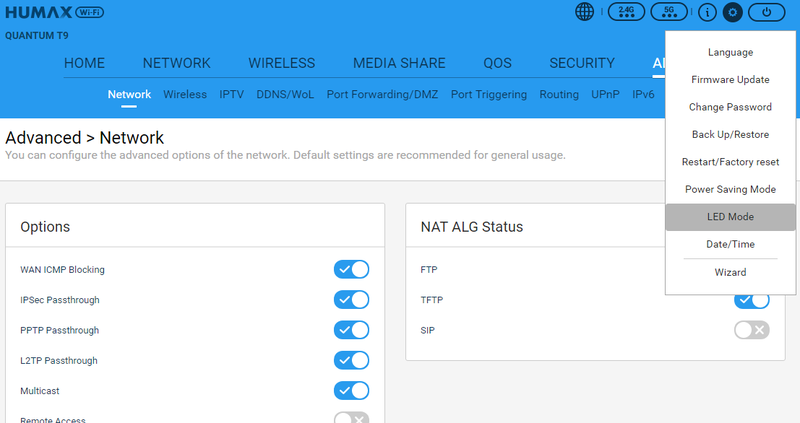 Enable ‘UPnP’ and configure the details. Run the program that supports UPnP (ex. Skype) and click the ‘refresh’ icon. Verify that the ports have been automatically configured. The HUMAX router allows you to connect and configure an IPTV set top box. Note: If the IPTV works in the default mode, there is no need to configure for IPTV. ※ ISP (Internet service provider): AT&T, KT, SKT, Vodafone etc. After configuration, connect the set top box to the IPTV Lan port on the HUMAX router. The IPTV should function properly. The following is an example of connecting a KT IPTV to the LAN port. 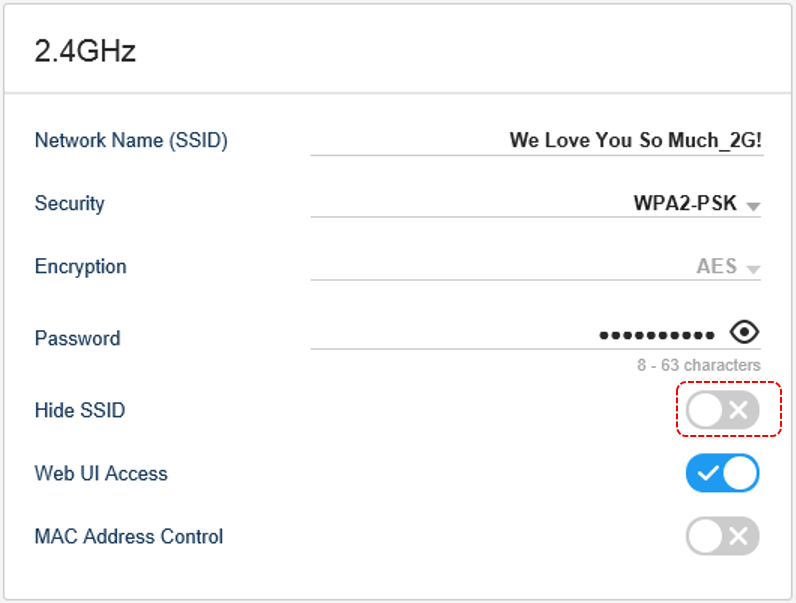 Note: You can access the HUMAX WEB UI of your router by Wi-Fi or from an internet LAN port. 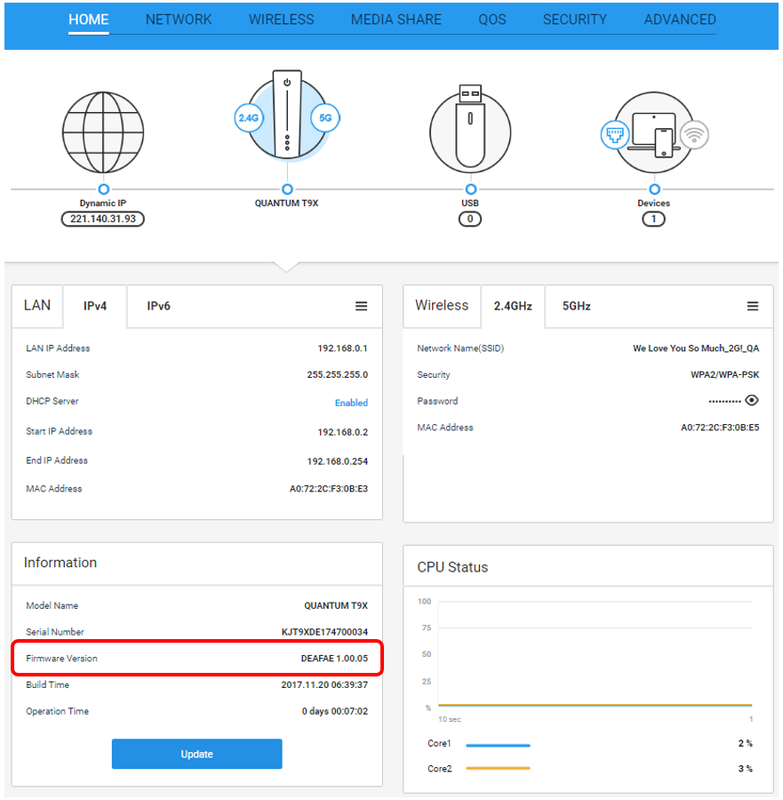 If you access a LAN port configured for IPTV or IP-Phone, the WEB UI may get disconnected. 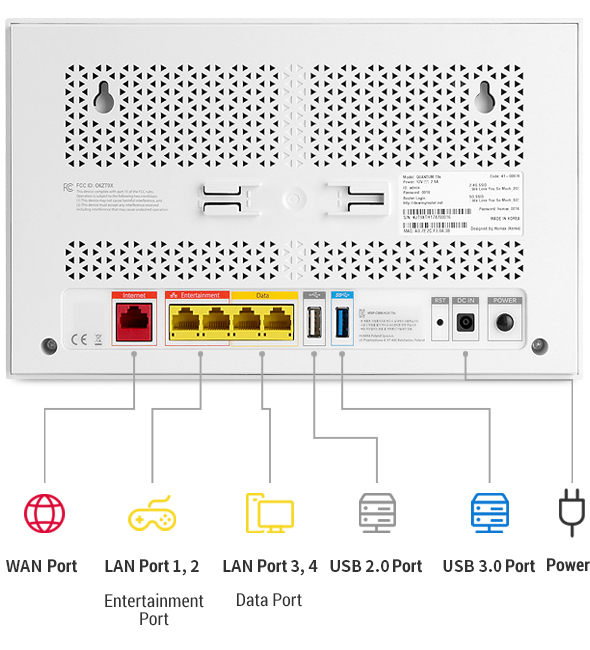 After entering your ISP detailed information, connect the set top box to the IPTV Lan port on the HUMAX router. The IPTV should function properly. 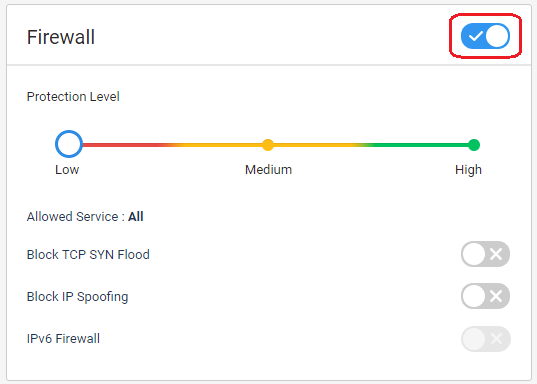 Note: Contact your local ISP operator for detailed information such as VLAN ID, VLAN Priority, etc. 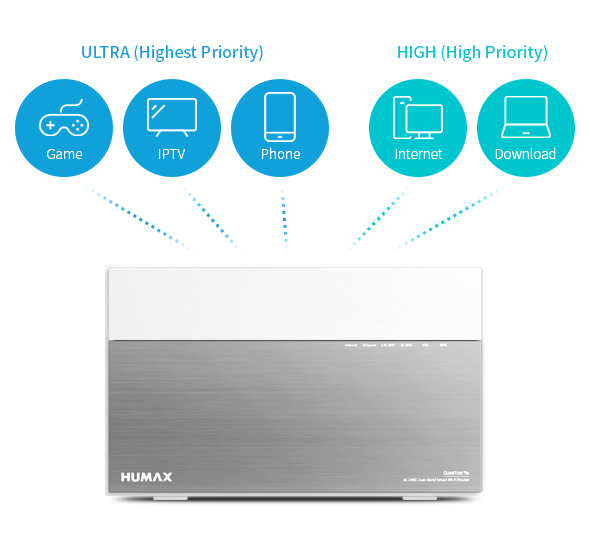 The HUMAX router supports virtual private network (VPN) server function by PPTP and L2TP (over IPSec) and VPN Client. 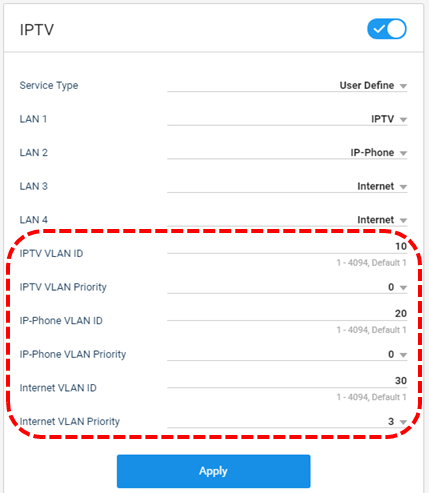 Do the following steps to configure the VPN server and connect to the VPN client. 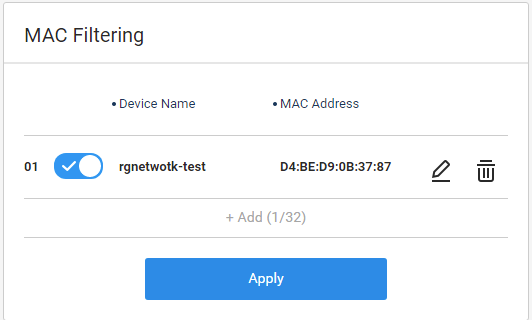 Open the browser of your preferred device and type http://dearmyrouter.net or http://192.168.1.1 in the address window to connect to the HUMAX WEB UI. 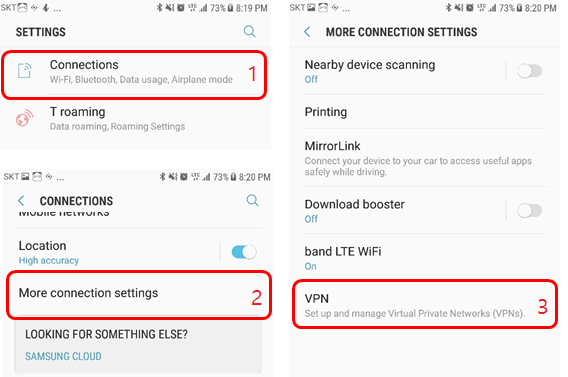 Select VPN Mode and VPN Type. 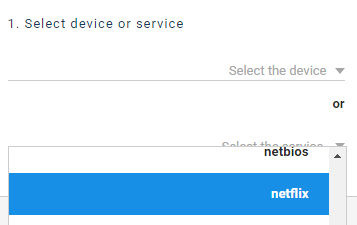 In order to use the VPN Server, select the type. For L2TP, you must configure the Pre-shared Key. You can add up to 10 accounts for each type. 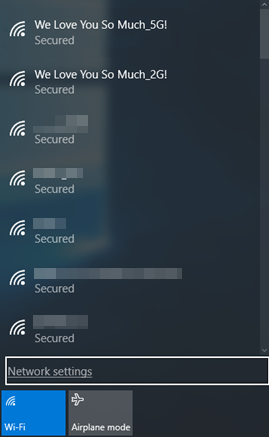 Note: Before configuration, make sure the HUMAX router is connected to the internet. 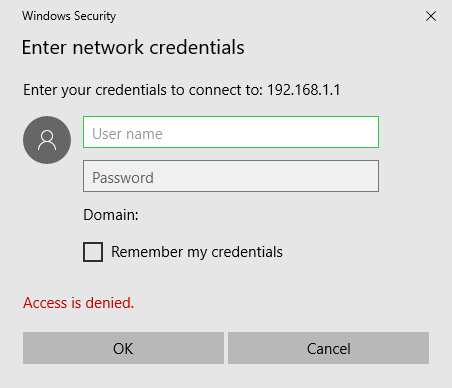 Connecting to the VPN server is different according to the OS of your preferred device. * iOS does not support PPTP type. Each mode allows connection to VPN server mode. 1. 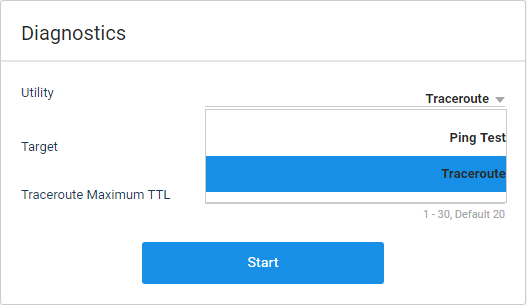 According to server type (PPTP/L2TP), configure the client type accordingly. 2. Some iPhones may not support PPTP. 3. For server type LT2P, a pre-shared key must be included. 4. For final configuration, information may be necessary for other fields. The HUMAX router supports VPN client function by PPTP and L2TP (over IPSec). Configure the VPN client and VPN server by the following steps. 1. 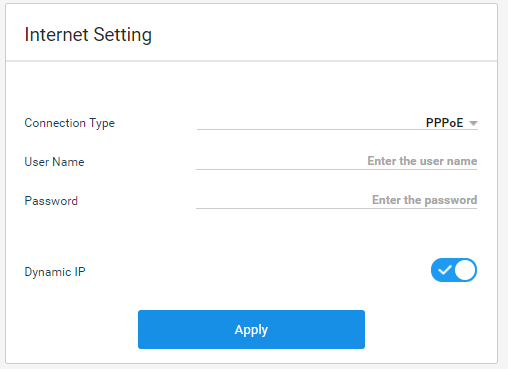 According to server type (PPTP/L2TP) to connect to, configure the HUMAX router VPN client type accordingly. 2. For server type LT2P, a pre-shared key must be included. 3. 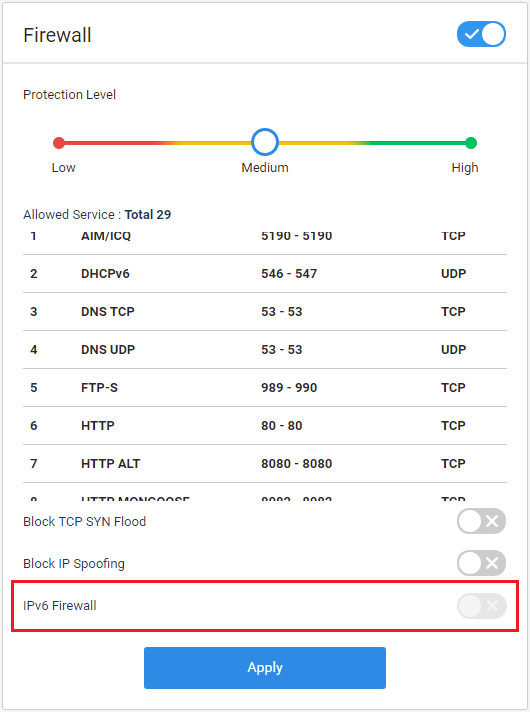 Connect to VPN server by L2TP (over IPSec), as there may be restrictions when using L2TP individually rather than L2TP (over IPSec). The HUMAX router allows you to restrict specific devices access to the router according to a device’s MAC address. 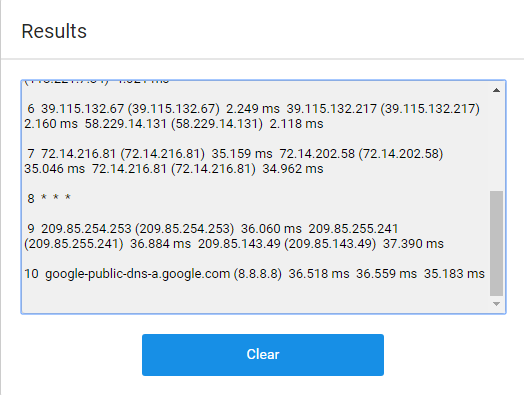 Open the browser of your preferred device and type http://dearmyrouter.net or http://192.168.1.1 in the address window to connect to the HUMAX WEB UI (http://dearmyrouter.net). 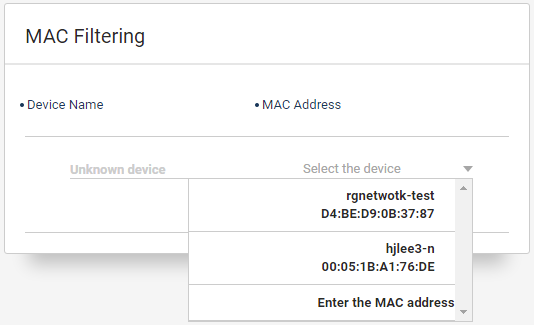 Select the device according to the MAC address. Click the pencil icon button on the right side of the list of connected devices to edit. 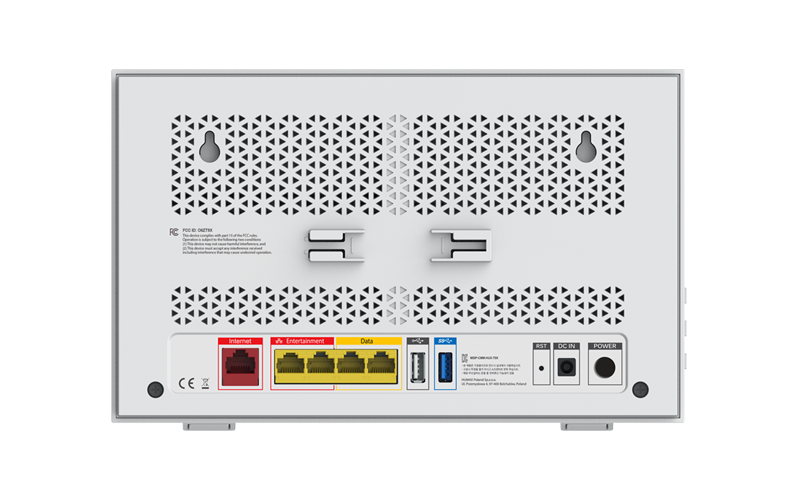 The HUMAX router allows you to easily use MAC filtering and see the information for all devices connected to it. Click ‘Devices’ in the HOME menu. Click ‘+’ to add for MAC Filtering. Verify the MAC address to be blocked. 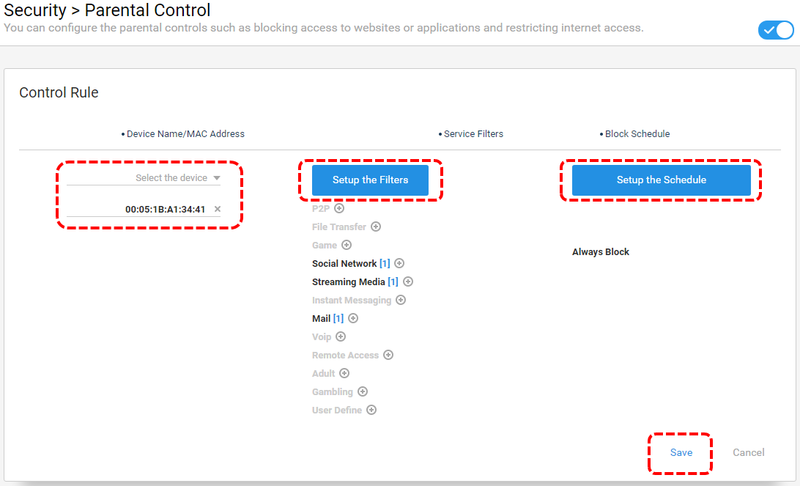 You can verify the address in the HUMAX WEB UI at SECURITY > Filtering > MAC Filtering. 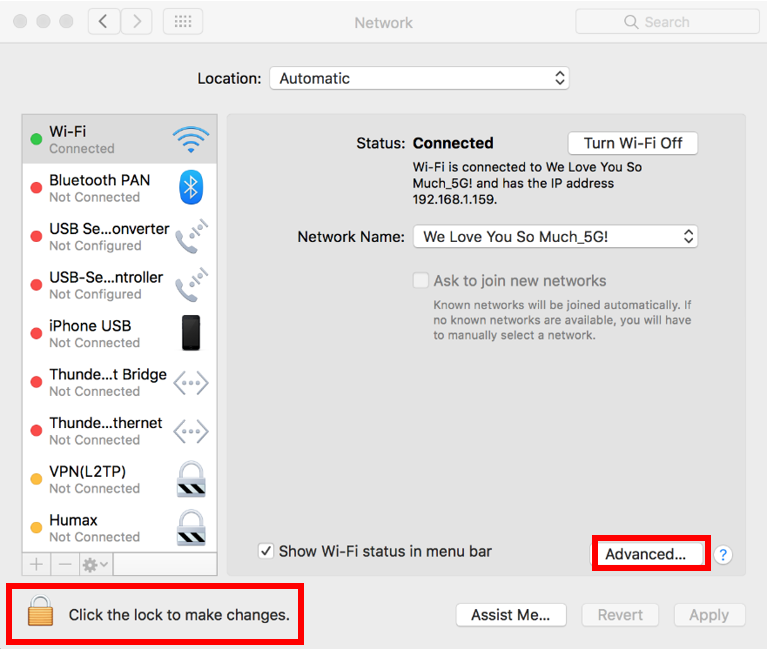 Click the icon to unblock the MAC address. The HUMAX router allows the blocking of certain internet sites or services by filtering the IP or port. The HUMAX router allows you to restrict and control the length of time and usage of games, You Tube, and SNS your children have access to. Click +Add and see the additional window for configuration. Configure ‘Device Name/MAC Address,’ ‘Service Filters,’ and ‘Block Schedule’ and click ‘Save’ to complete the process. Click ‘Select the Device’ to see all the devices connected to the HUMAX router. 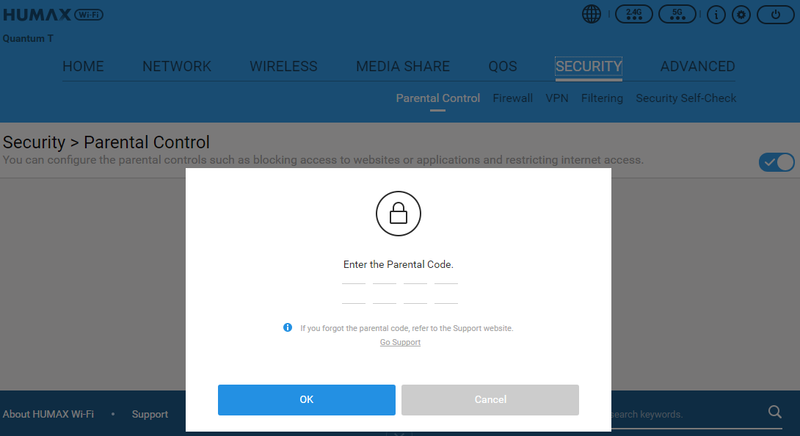 If you find the device to add ‘Parental Control,’ click on that device. 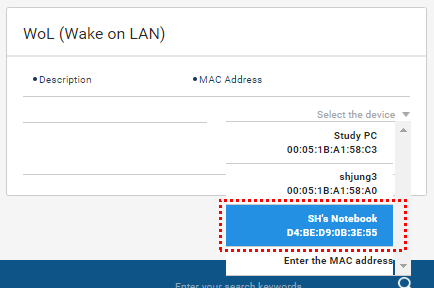 If you don’t see the device on the list, click ‘Enter the MAC Address’ (below blue diagram). Multiple devices may be configured. Click ‘Setup the Filters’ to open a window with a list of various services. Click each service to find a detailed list. Click the specific service(s) to be added. Multiple services may be configured. If the service is not found in the list, click ‘User Define’ to manually configure the services. Click to add keyword or URL address. Afterwards, click ‘Save’ to complete the process. Click ‘Setup the Schedule’ to open a window to configure the schedule times. 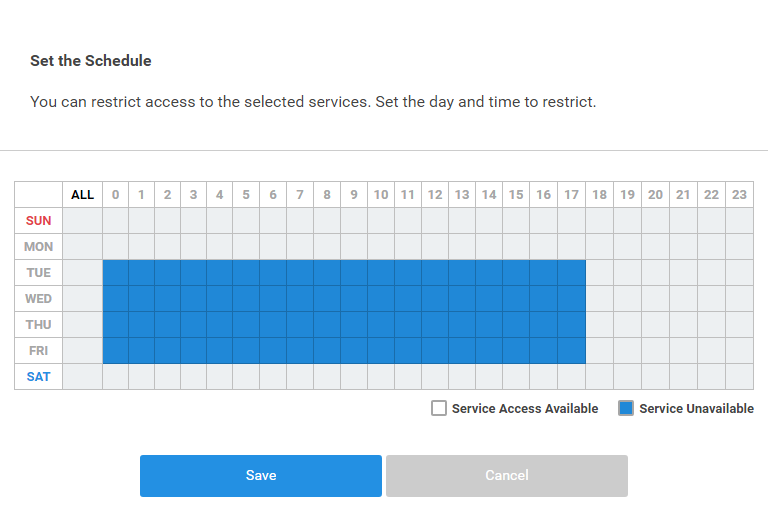 You can click or drag to configure the hours and days to restrict access. After selecting the activation time period, click ‘Save’ to complete the process. The HUMAX router provides for a parental code for secure access to Parental Control. You will be directed to a page to set the parental code. After setting the parental code, click ‘OK’ to complete the process. The next page will ask you to input a parental code. The HUMAX router has a Wake-on-LAN function that allows you to power on a PC connected to the network. Note: This function only works with PCs that support WoL. 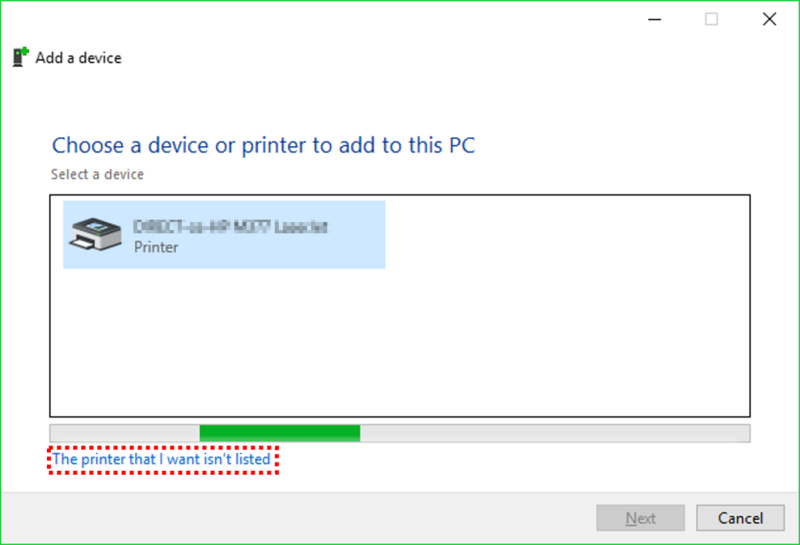 Some PCs may require a change in configuration either in the BIOS or network driver. 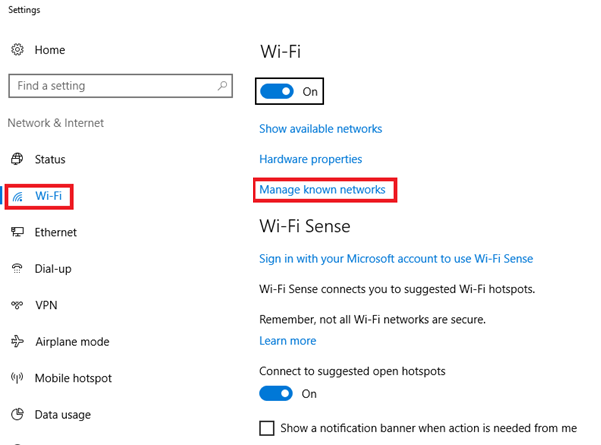 Go to the Control Panel > Device Manager > Network adapters > right click the network card > Properties > Details > Advanced > enable Wake On Magic packet. NOTE: If your network card does not support WoL, you may not see the feature. Click to add the MAC address of the PC. 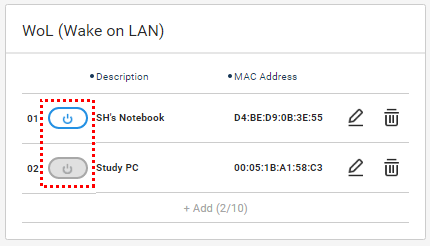 A PC that has previously connected to the router will be pop up in a list. Click the PC to add. 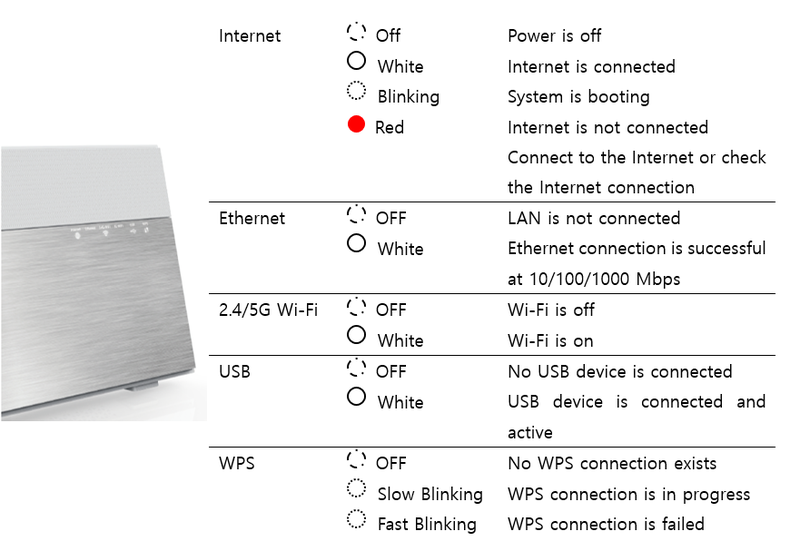 Note: A PC that was previously connected by Wi-Fi will not be found on the list, as the WoL function does not work with devices connected wirelessly. 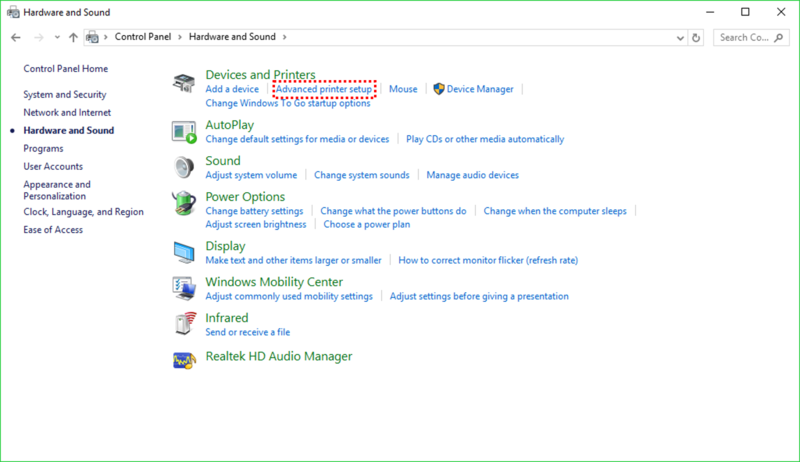 You can power your PC when the icon is colored (activated). A dark icon represents a PC that is either already on or not connected to the network. 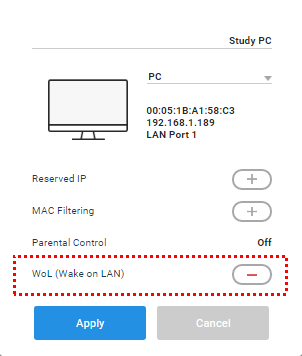 Note: The WoL feature only works with PCs that are connected by a LAN cable to the router. Afterwards, go to the HUMAX WEB UI Home page and click ‘Devices’ to see which devices are configured for WoL. The HUMAX router allows access to it from a device outside the network. Open the browser of your preferred device and type http://dearmyrouter.net or http://192.168.1.1 in the address window to connect to HUMAX WEB UI. To configure manually, click ‘User Define’ and input the port details. A DMZ (demilitarized zone) on a home router refers to a DMZ host which is a host on the internal network that has all UDP and TCP ports open and exposed, except those ports otherwise forwarded. The HUMAX router allows to act as a DMZ host. The HUMAX router supports HUMAX DDNS, a service provided by HUMAX that allows you to use DDNS easily and free of charge. Configure HUMAX DDNS to allow access to the HUMAX router from a device outside the network. Note: In order to configure the HUMAX router to access devices connected to the network, UPnP and Port Forwarding configuration is necessary. Select ‘HumaxDDNS’ as the service provider. Verify that the domain is updated properly as shown below. The DDNS host is configured as HostName.dearmyrouter.net. Note: To connect to HUMAX router, remote connection function must be enabled. Connecting to the HUMAX Router. The HUMAX router supports Internet Protocol version 6 (IPv6). If there is an IPv6 server connected to the HUMAX router, it will provide an IPv6 address to all the devices connected to the network to allow internet access. Note: This function is available only when an IPv6 server is connected to the HUMAX router and if the connected devices support IPv6. The HUMAX router may reboot. Please wait for the reboot process to be completed. Afterwards, go to the WEB UI Home page and click the HUMAX router icon to verify IPv6 address in details. Note: In the event that the router is given an IPv6 address from the IPv6 server above, a ‘Global IPv6 Address’ will be shown. If there is no IPv6 server or if the router does not receive an IPv6 address, a ‘Unique IPv6 Address’ will be shown. 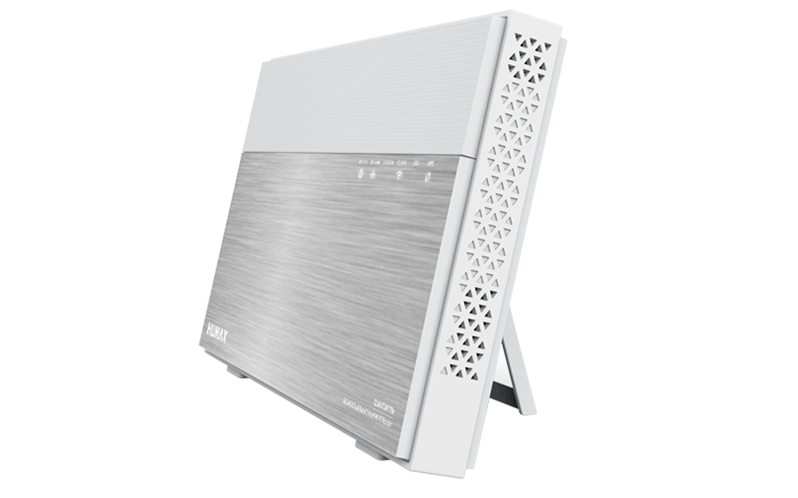 The HUMAX router provides firewall protection for security. The ‘Allowed Services’ will be shown according to the security level. 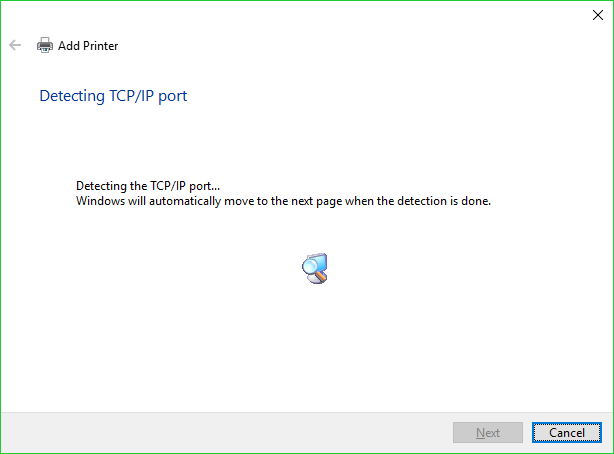 To prevent DOS attacks, enable ‘Block TCP SYN flooding’ and ‘Block IP Spoofing’ functions. The HUMAX router prioritizes the services for all the devices connected to the network for faster processing. It is possible configure Bit Torrent or Netflix services to have priority for better streaming. It is possible to configure certain devices to have priority for better internet access. Enable ‘QoS’ and click the add button to select the desired devices and services. When the priority box pops up, drag the selected devices and/or services in the priority box. Drag the level of priority for the devices and services. 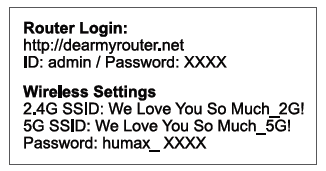 The HUMAX router allows you to check the security status. A list will show the categories and their risk level. Red will signify that there is a risk, while blue will signify that there is no risk. Click on the red links to change the configurations. Login Password Changed: Shows if the login password was changed. 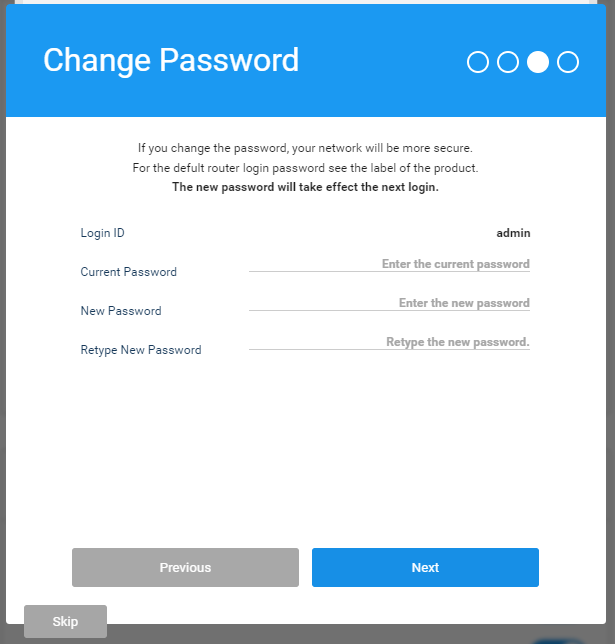 Increase security by changing the password after the initial login. PING from WAN: Shows if configuration prevents attacks by PING by a device outside the network. DMZ: Shows if the DMZ function is enabled. Use caution so that the host is not unintentionally exposed to devices outside the network due to improper settings. Port Triggering: Requires caution when enabled, as this will allow devices outside the network to access the network through certain ports. 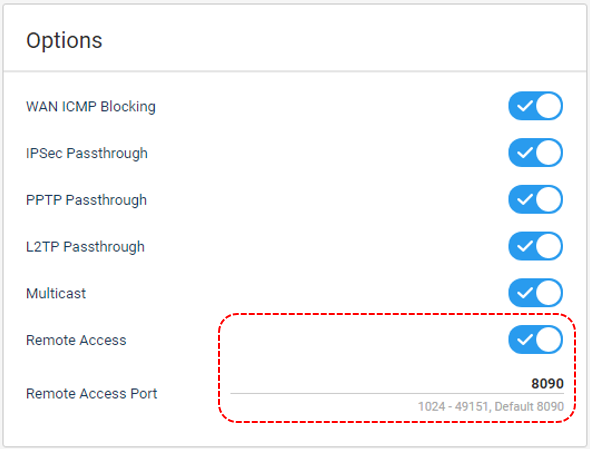 Port Forwarding: Requires caution when enabled, as this will allow devices outside the network to access the network through certain ports. 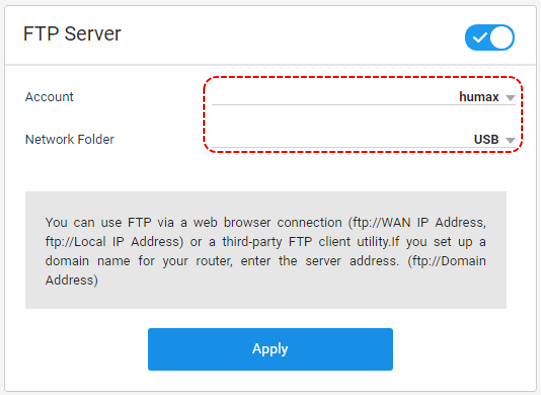 Anonymous Login to FTP Server: Shows if anonymous login to the ftp server is allowed. Requires caution, as it allows any anonymous account to have access to the files on the server without password protection. The HUMAX router allows you to self-check the internet connection. The ‘Results’ page will show the outcome. Note: If there is a problem with the internet connection, the outcome will show as ‘Fail.’ The following type of outcome will occur when the ping is sent in normal conditions. The diagnostic may take longer according to the internet connection. The following type of outcome will occur when the trace route is completed normally. The LED has 4 brightness settings: High, Medium, Low, and Off. Any changes without clicking ‘Apply’ will be temporary. Check the brightness of the LED and select an appropriate brightness. Click ‘Apply’ to make any changes permanent. The HUMAX router allows you to control when the LED lights are on. 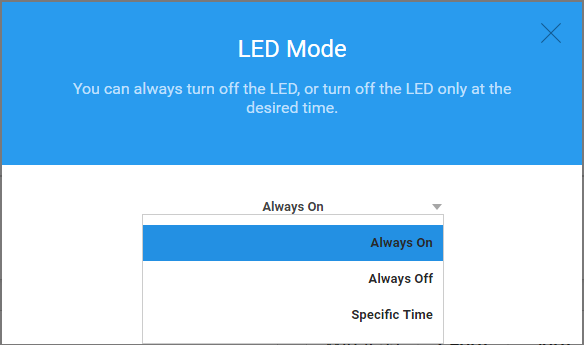 Enable ‘LED Schedule,’ select the ‘LED Specific Brightness,’ and select the start and end times of the schedule. Click ‘Apply’ to complete the process. The diagram below shows the LED configured to be off from 21:00 ~ 06:00 and at ‘Mid’ level brightness during other times. At the right of the HUMAX router is a button to control LED brightness. 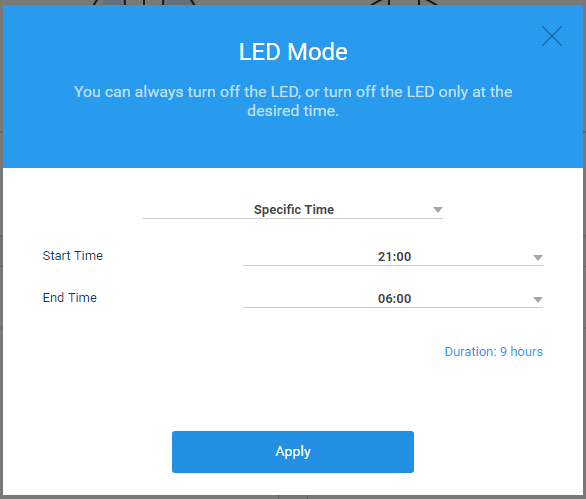 Note: LED scheduling is possible only through the HUMAX WEB UI. The HUMAX router allows remote access from outside the network. Open the browser of your preferred device and type http://dearmyrouter.net or http://192.168.1.1 in the address window to connect HUMAX WEB UI. Connect to the HUMAX router by the IP address or DDSN domain address and port number from your preferred browser. Go to the Home menu. 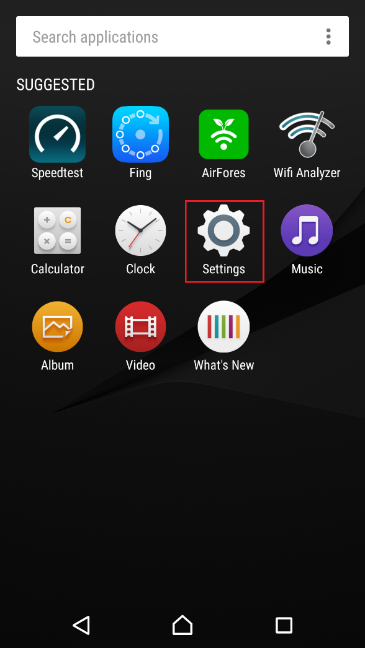 The firmware version can be verified at the ‘HOME’ menu. 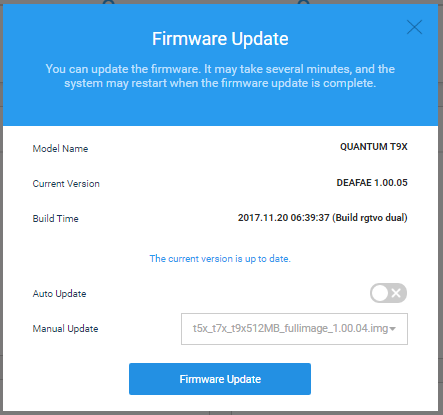 Verify the firmware version in the information box as shown below. HUMAX regularly updates the firmware and recommends installing the most recent firmware for performance improvements, functional additions, improved stability, increased security, etc. 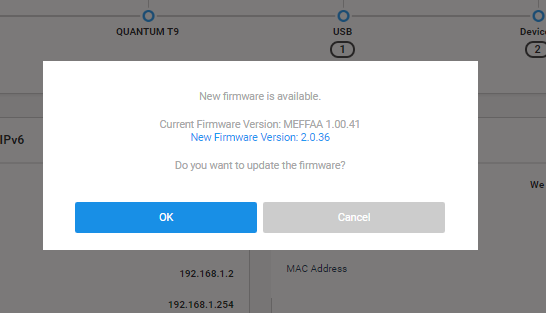 HUMAX regularly updates the firmware recommends installing the most recent firmware for performance improvements, functional additions, improved stability, increased security, etc. If you have a separate firmware file to install, click ‘Choose the file’ and find the file and select it. After selecting the file, you will the following page. 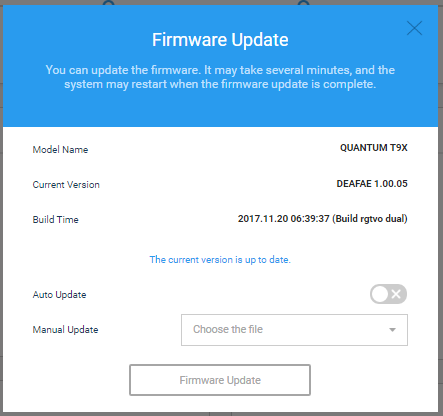 Click ‘Firmware Update’ to see the following message. Click ‘OK’ to begin the update process and you will see the following page. Thereafter, LED will begin to flash. The update may take many minutes. If the update is completed properly, the LED will stop flashing and keeps the white color. 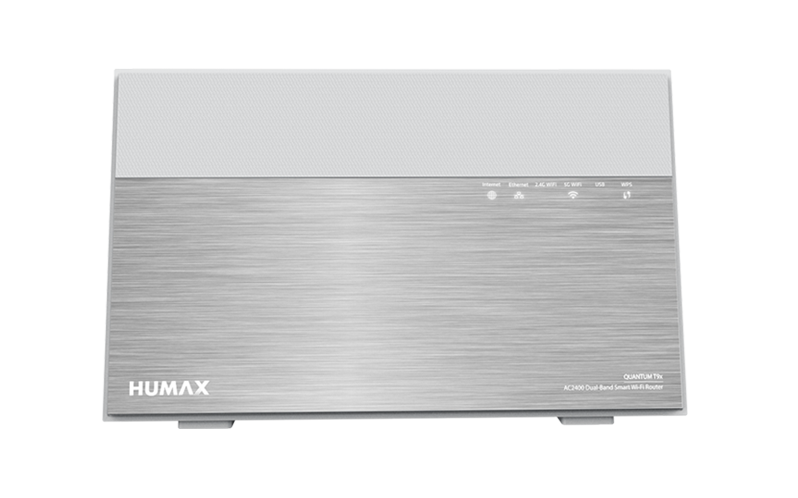 To update from the HUMAX server, click ‘Firmware Update’ to download the firmware and begin the update process. The same process will occur as in Step 3. 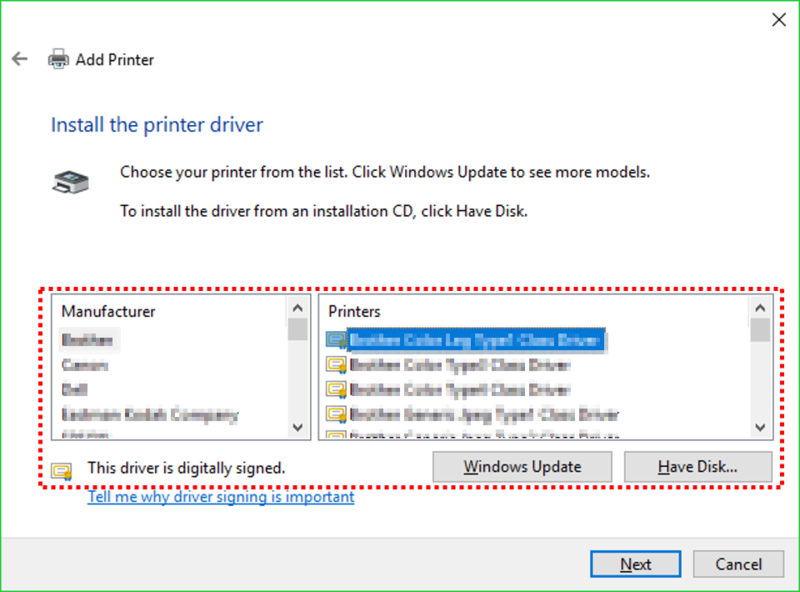 Enable ‘Auto Update’ in the Firmware Update window as the page below. After the next login, the router will connect to the server and verify if there is a new firmware update available. Enable ‘Auto Update.’ After the next login, the router will connect to the server and verify if there is a new firmware update available. If a new update is available, the following page will appear. Click ‘OK’ to begin the update process. Note: If you have problems connecting to the HUMAX WEB UI after an update, delete the temporary cash file(s) of your browser for better connection to the WEB UI. 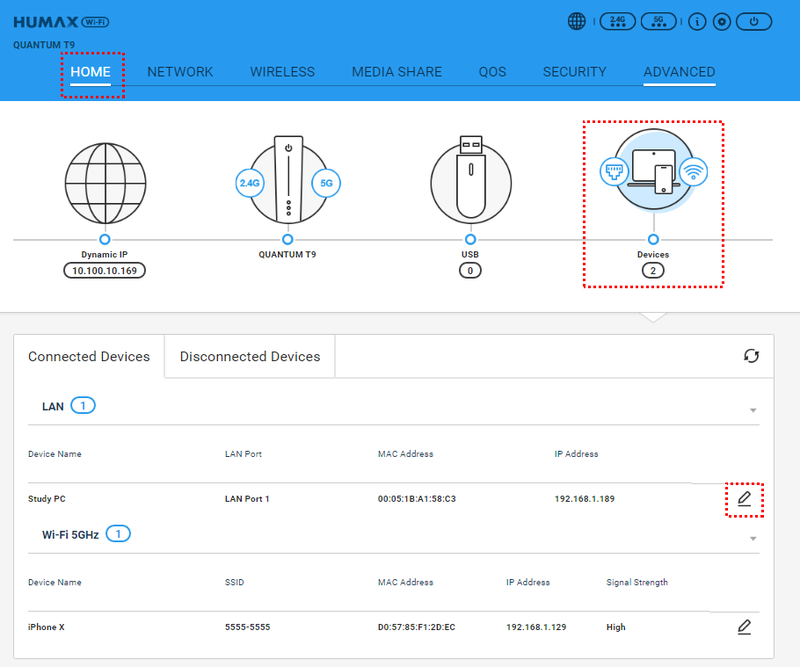 The HUMAX router allows you to verify configured internal and external IP addresses as well as the IP addresses of all devices (PC, smart phones, etc.) connected to the network. Go to the Home menu and click on the ‘Internet’ icon to verify the external IP address of the router. Click the ‘HUMAX Router’ icon to verify the internal IP address of the router. 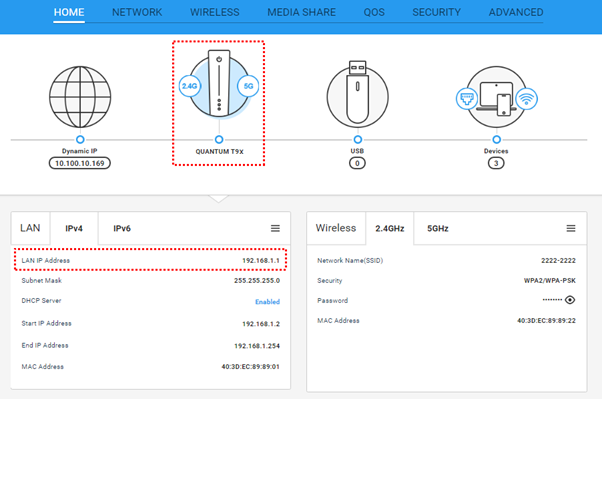 Click the ‘Devices’ icon to verify the IP addresses of all devices connected to the network. Note: To verify the IPv6 address, go to HOME > FAQ > 6. Advanced Configuration > IPv6 Configuration. 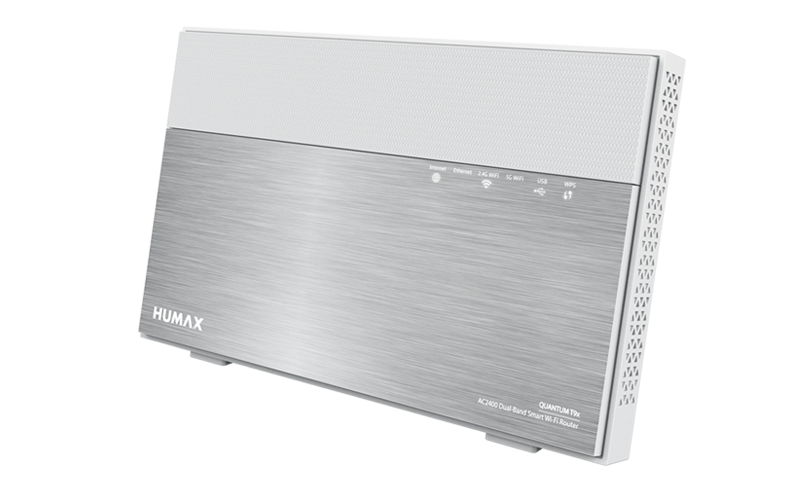 The HUMAX router has multiple user, multiple input, multiple output (MU-MIMO) technology for improved wireless performance. Each antenna communicates with each device to provide improved capacity over existing MIMO technology. 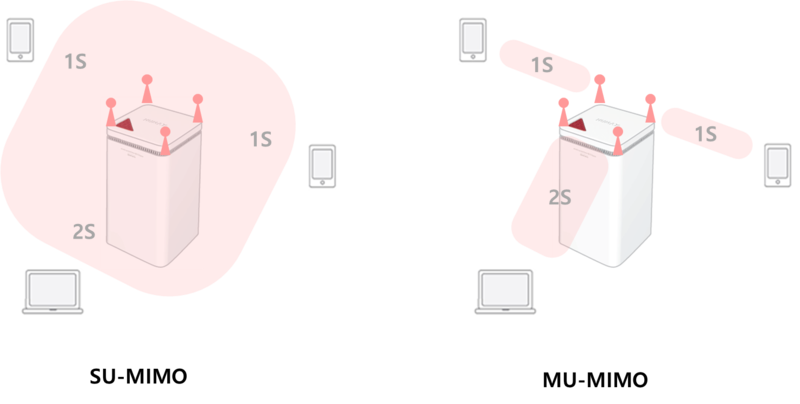 Existing MIMO technology uses the SU-MIMO, causing communication to go to one device first and then to go other devices sequentially when multiple devices are present. However, the HUMAX router uses MU-MIMO technology which allows simultaneous communication to all devices at optimal speeds, increasing wireless capacity usage. This allows simultaneous streaming of multimedia services to multiple devices. 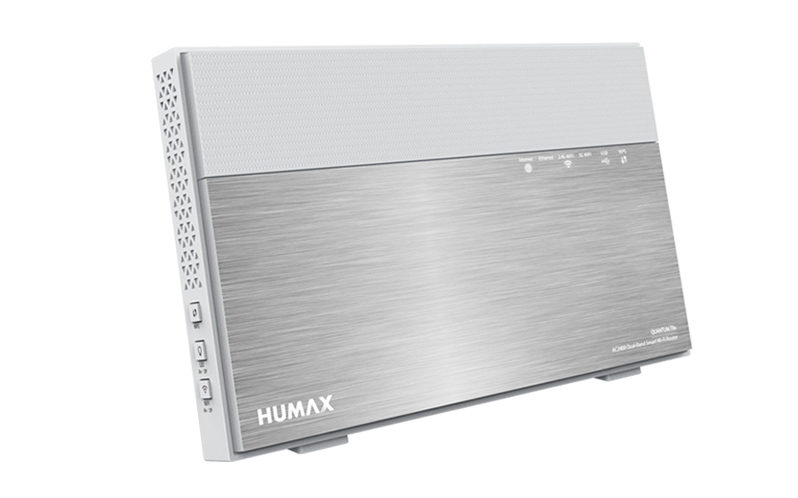 The HUMAX router allows you to restart the device or return the router to the original factory settings. A restart can be done either through the HUMAX WEB UI or by a physical button. While the router is restarting, there is limited wireless and internet access. 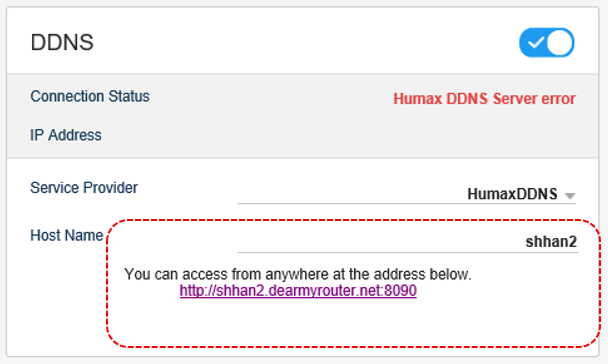 Open the browser of your preferred device and type http://dearmyrouter.net or http://192.168.1.1 in the address window to the HUMAX WEB UI. Click ‘Restart’ on the new page to begin the process. Click ‘Cancel’ to stop the restart process. You will go back to the previous page. Click ‘OK’ to begin the restart. After the restart, the login page will appear. The reset button can be found at the back of the router. Press the button for 3 seconds and the LED lights will go dark and begin the restart process. 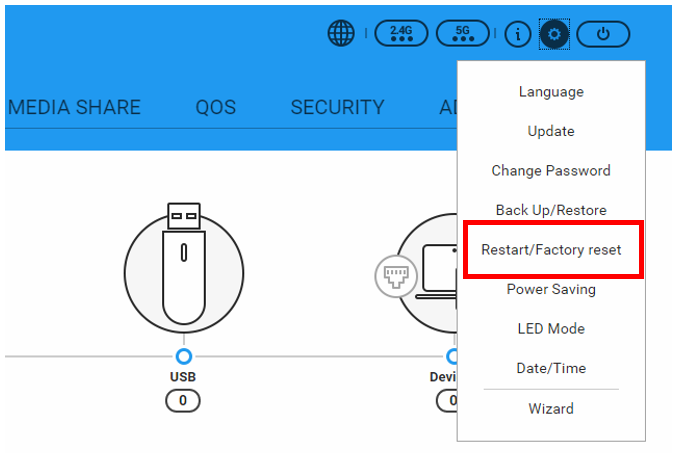 A factory reset will cause the router to return to the factory settings and can be done either through the HUMAX WEB UI or by a physical button. 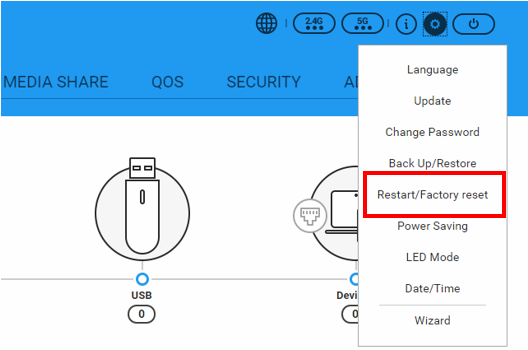 After the factory reset, all configurations will be lost and return to the original factory settings, and the router will restart. When the router is restarting, there is limited wireless and internet access. 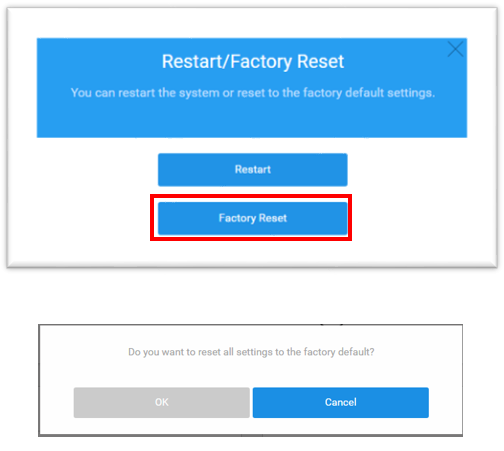 Click ‘Factory Reset’ on the new page to begin the process. 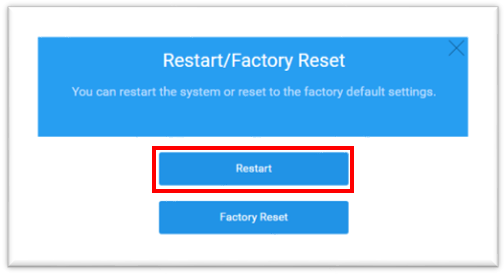 Click ‘Cancel’ to stop the reset process (going back to the previous page). Click ‘OK’ to begin the reset. 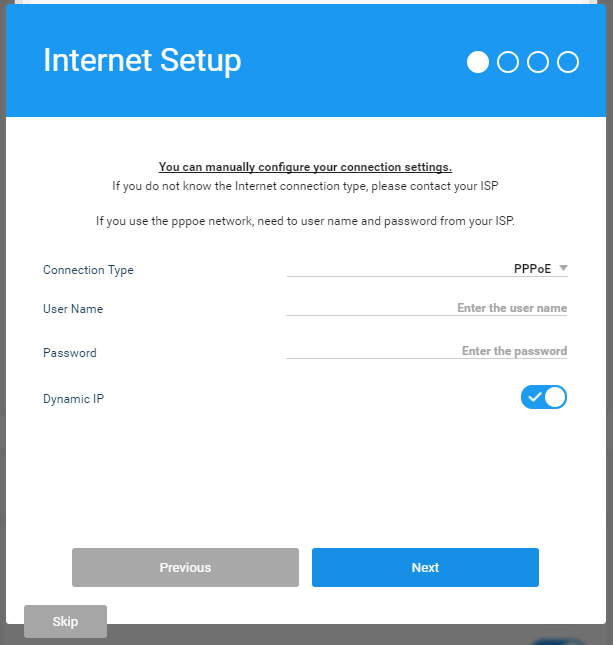 After the reset, the router will restart and the login page will appear. The reset button can be found at the back of the router. Press the button for more than 5 seconds and the LED lights will blink rapidly and begin the factory reset process. 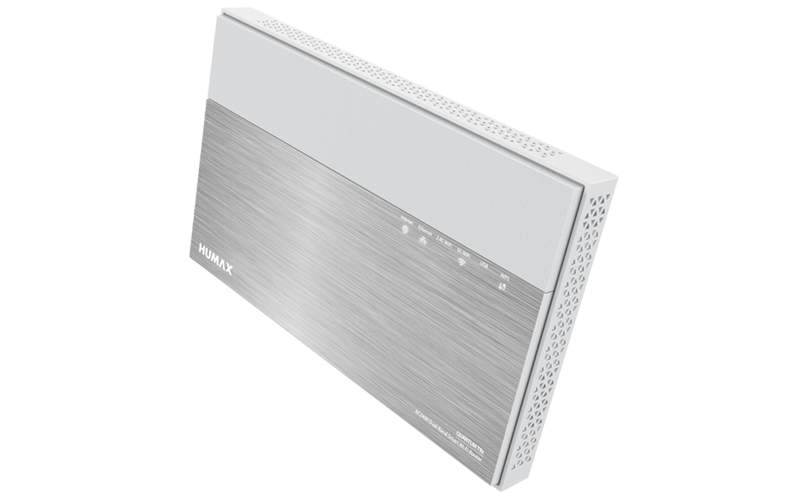 The HUMAX router has a two wide area networks (WAN) with a dual WAN capability. Configure dual LAN by the following steps. 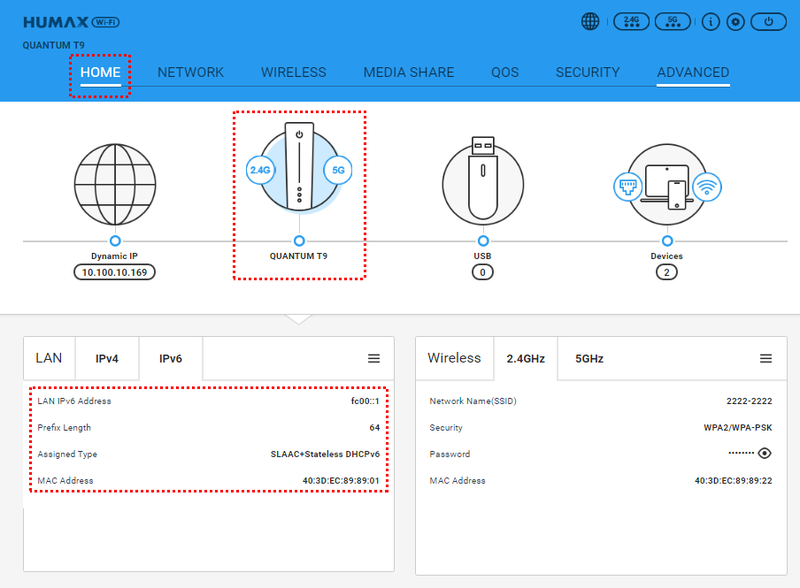 Note: To use both WAN, connect the LAN cable from the modem to the router and connect another USB mobile broadband modem or Android device to the router. Note: Internet service charges may occur from using mobile 3G, 4G, LTE, etc. WAN services. 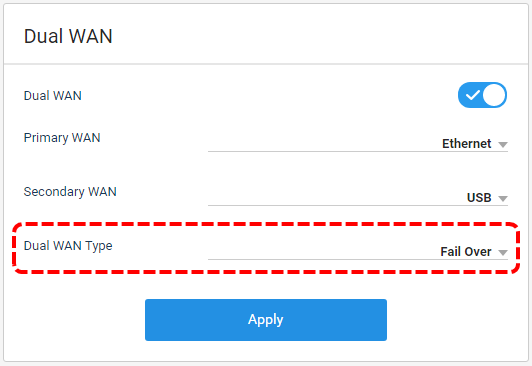 Enable ‘Dual WAN’ and select the primary and secondary WAN. 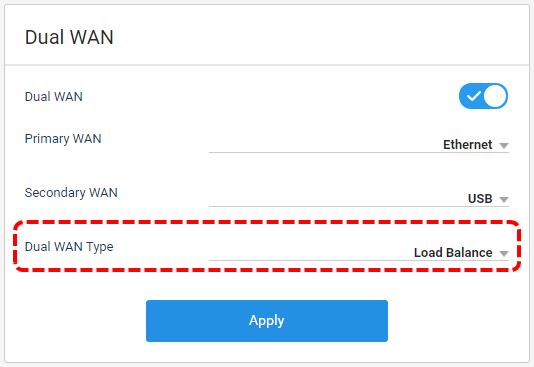 To enable the Dual WAN function, configure the Dual WAN Type to “Fail Over.” The primary WAN is the main WAN to use and the secondary WAN is a backup for use when the primary WAN internet connection is disconnected. Both primary & secondary WAN support Ethernet, USB, and Android tethering. When both WAN are connected to the internet, communication is through the primary WAN. 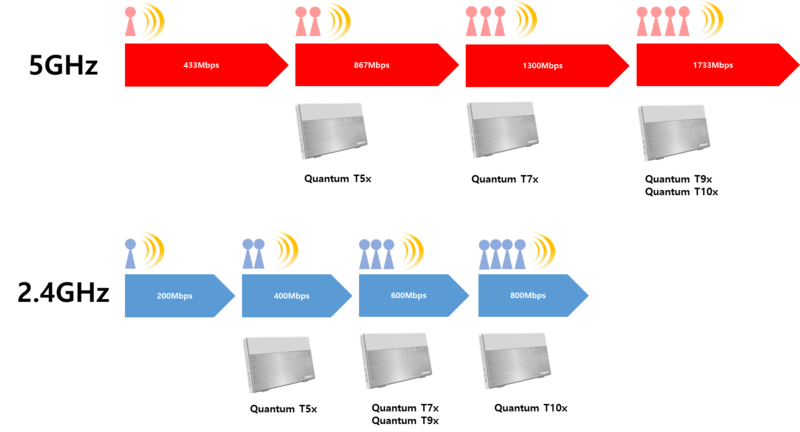 If the primary WAN is disconnected from the internet, the secondary WAN is used to connect to the internet to minimize communication stoppage. 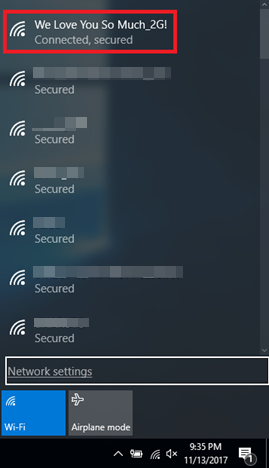 If only one of the WAN is connected to the internet, communication is though that WAN. 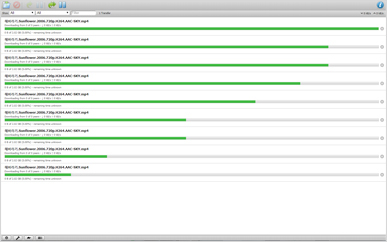 The following shows the Ethernet as the primary WAN and an Android tethering as the secondary WAN. 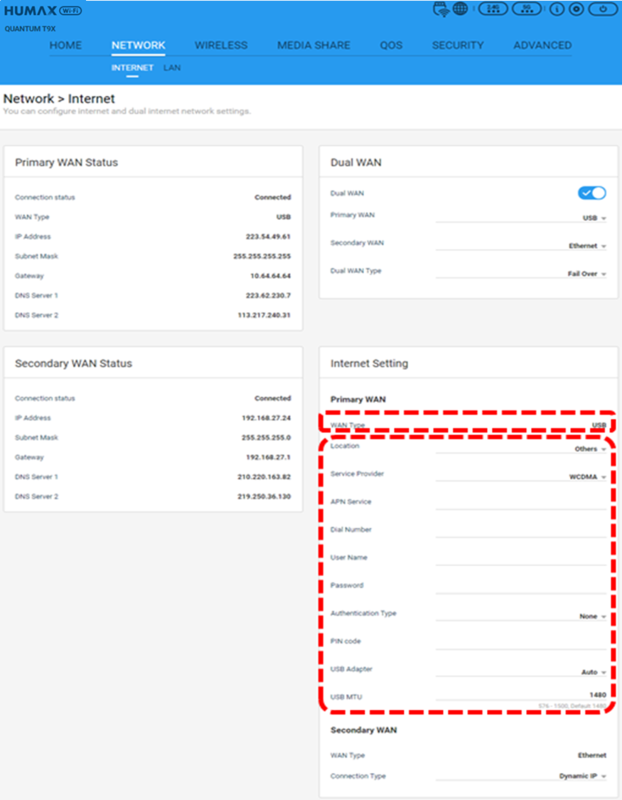 When using the Dual WAN function, configure the Dual WAN load balance. 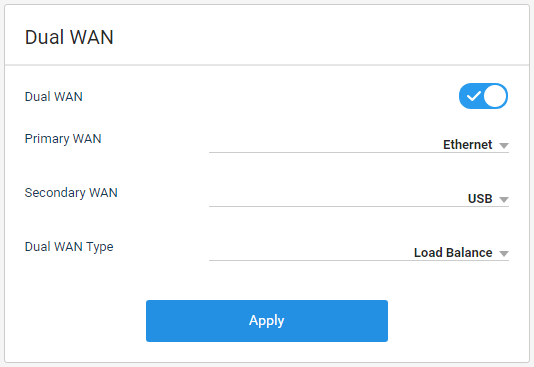 Select which will be the primary and secondary WAN. HUMAX recommends using the faster speed WAN as the primary WAN. Both primary and secondary WAN support Ethernet, USB, and Android tethering. If two WANs are connected to the internet, both WANs are used. Therefore, both internet bandwidths are used, increasing internet speed versus using just one WAN. 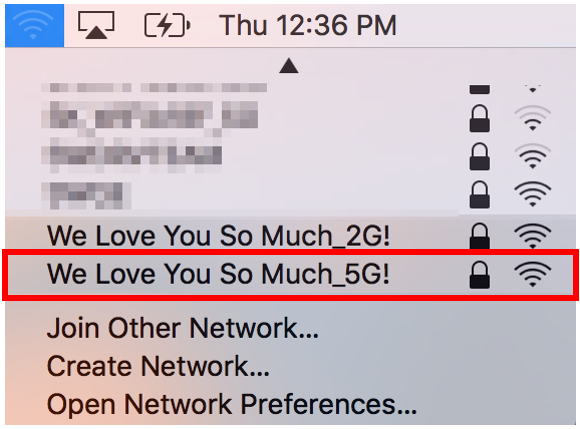 Each WAN communicates equally. There may be a difference in speed according to bandwidth, line status, connection status type, etc. In the case when only one of the two WAN is used, communication is through the connected WAN. The following shows an Ethernet WAN and USB Modem configuration. The HUMAX router allows tethering of an Android device to the router’s USB port as an internet connection. The following shows the steps to configure Android Tethering WAN. Note: Internet service charges may occur on the device when using Android Tethering WAN. First configure Dual WAN function to configure Android Tethering. Select USB as either the primary or secondary WAN. When the Dual WAN is configured, the following ‘Internet’ page appears. This is shown when Android Tethering is selected as the secondary WAN. 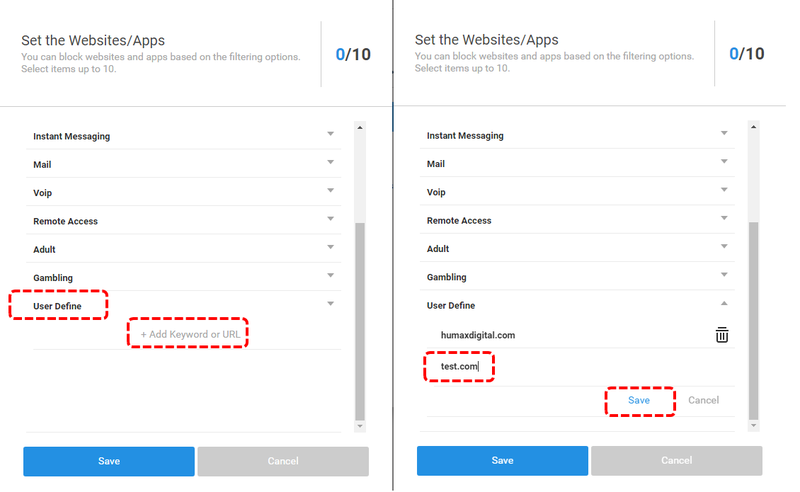 Verify Android Tethering status by looking at the connection status or clicking on the ‘Internet’ icon on the Home page of the HUMAX WEB UI. After configuring in the HUMAX WEB UI, connect your preferred Android device to the USB port of the HUMAX router. Enable tethering in the Android device. It is now possible to use to internet through the Android Tethering WAN. Note: Configuring for USB tethering may different for each Android device. The HUMAX router allows you to use a USB mobile broadband modem to connect to the internet. The following shows the steps to configure USB WAN. Note: To use USB WAN, connect the USB mobile broadband modem to the router USB port. The USB modem must be signed up to an ISP 3G, 4G, LTE, etc. broadband service. Note: Internet service charges may occur on the device when using USB WAN. First configure Dual WAN function. 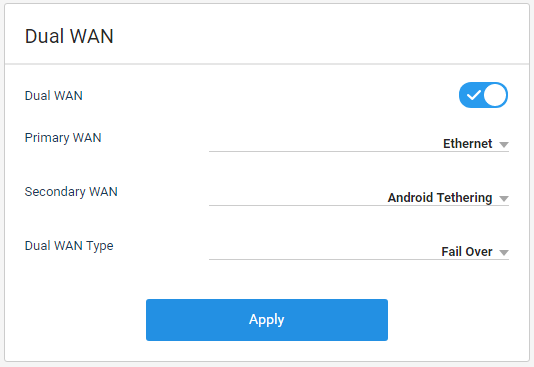 Select Android Tethering as either the primary or secondary WAN. If Dual WAN configuration is completed, the following ‘Internet’ page appears. 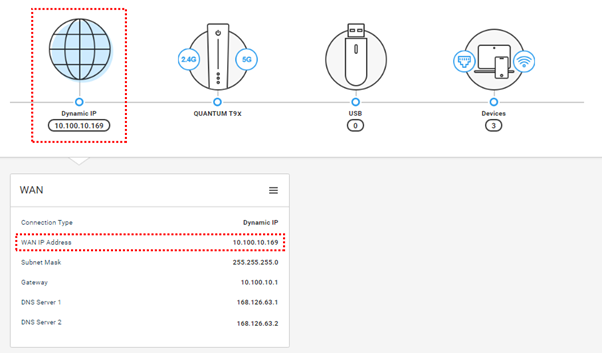 Configure the USB WAN by adding the details in the red boxes. The following shows when USB WAN is selected as the primary WAN. 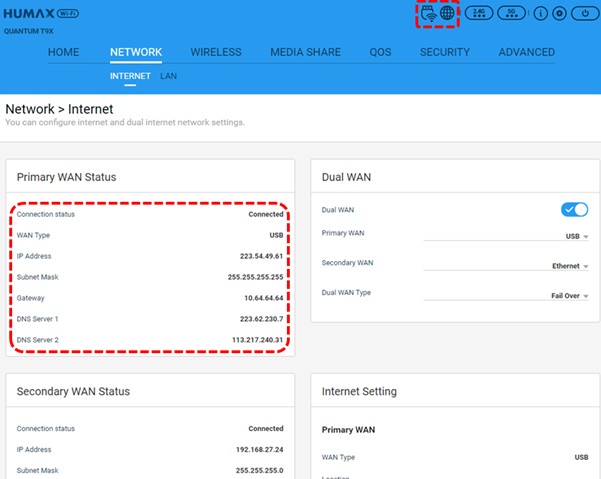 If the USB WAN is the secondary WAN, configure the USB WAN on the ‘Internet Setting’ page. Add the details of the ISP such APN service, dial number, user name, password, authentication type, and PIN code. Contact your ISP if necessary, as settings are different for each ISP. Only configure USB MTU in special cases. Only lower the MTU if the USB WAN does not connect or the internet gets disconnected after configuration. 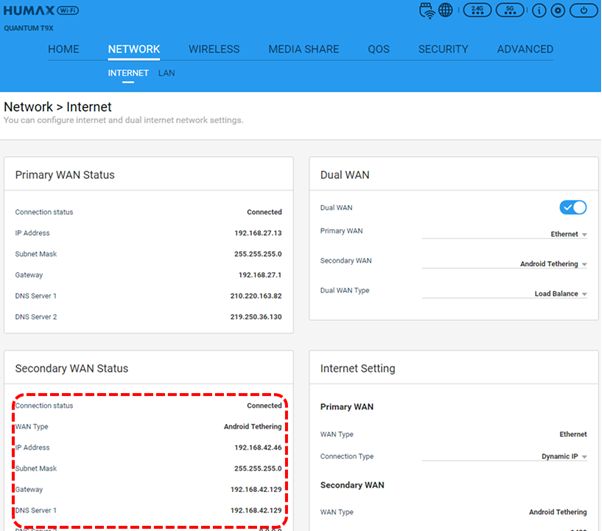 After completing configuration, verify USB WAN status by checking Connection Status or clicking on the ‘Internet’ icon on the Home page of the HUMAX WEB UI. The following is when USB WAN is configured as the primary WAN. 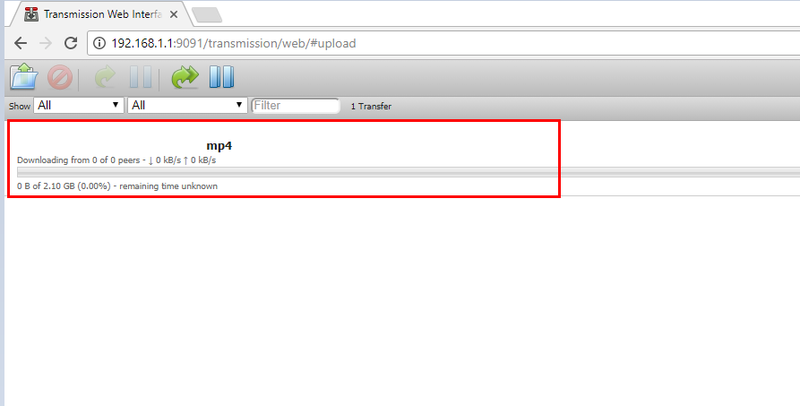 The HUMAX router acts as a torrent client. The torrent files can be downloaded to the USB storage device connected with the HUMAX router. Torrent fucntion is supported from software version 1.00.56 for Quantum T9 / T7 / T5 and 1.00.05 for Quantum T9X / T7X / T5X. ※ Note: In order to use the Torrent function, a USB memory or external hard drive must be connected to the HUMAX router. 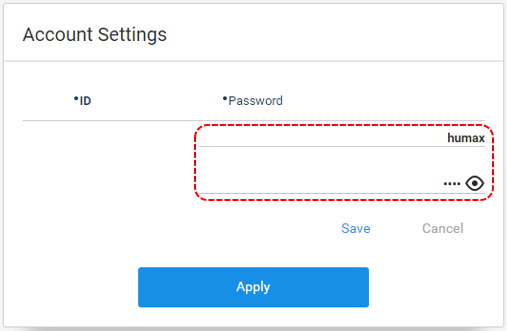 Configure the account and setup password in the ‘Account Settings.’ This account will the account used when accessing the file server supplied by the HUMAX Router. ※ Note: the account can be used to all server provided by the HUMAX router. ※ Note: admin/root/anonymous are not allowed to use as account. Select the account name USB device. ※ Note: the product supported a USB port, selected automatically. the product supported 2 USB ports, able to select between 2 USB devices. Once completed the configuration, link for ‘Access the Torrent Program’ is created. 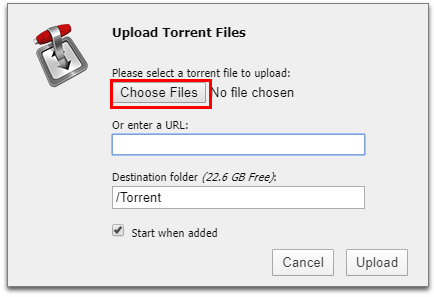 How to use Torrent function? 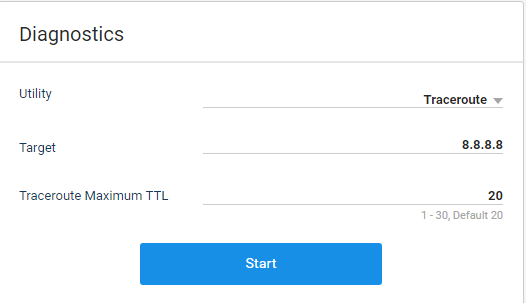 To access Torrent WEB UI, Click link for ‘Access the Torrent Program’ on the configuration page or type http://dearmyrouter.net:9010 or http://192.168.1.1:9010 in the browser. Choose Torrent file on the pop up. Torrent file is able to download to your USB storage device connected to the HUMAX Router. ※ Note: excessive using Torrent files shall affect the router performance. It can be set up only when USB is connected. Supports only T10x, T9, T9x, T7, T7x, T5, and T5x models, which are High Performance Routers. 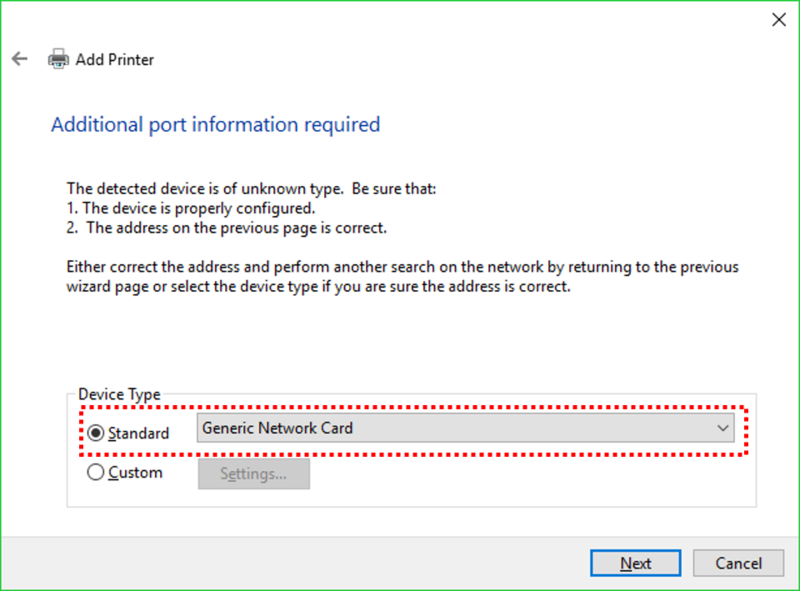 Click the Add button on the Network Folder card after making sure that the USB is connected as shown below. Click Add followed by Select the folder to Share. Select the folder you want to share and click the OK button. If the Folder Path is too long, it may not be set. Select a Folder, enter the Network Folder name in the Description, select Write/Read in the Folder, and click Save. Please restrict the authority set in the folder to Write/Read or Read only when using FTP/SAMBA/Webdav. 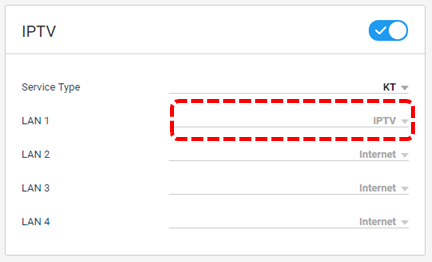 When all the settings of the Network Folder are completed, click the Apply button. If you see the result shown below, the Network Folder setup is complete. After setting the Account to use in Time Machine, click the Add button. The account you set up is available in FTP/SAMBA/WebDav. Enter the ID and Password you want to use in Enter the ID/ Enter the Password fields. Click the Eye Icon to check the Password you entered. Enter your ID/Password and click Save. 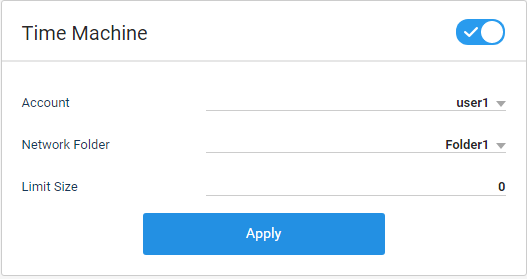 Be sure to click Apply in order to create an account normally. Click the Apply button to complete account creation as shown below. Once you have set up the Network Folder and Account above, click the Media share > Server settings menu. Click the X button as shown below to activate the Time Machine menu. 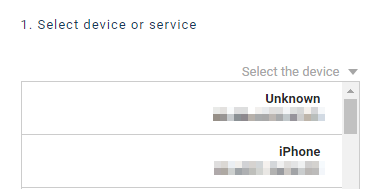 In the activated Time Machine menu, select the Account / Network Folder you created above. Limit Size is the capacity to use for the Network Folder. If this is set to a small size, backup may not be performed. Therefore, set it to 0 so that the USB capacity can be fully used. 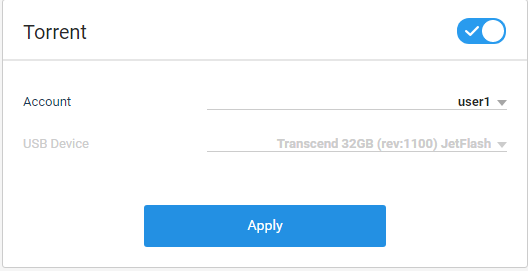 Click the Apply button to complete the Time Machine setup. Please refer to the Apple Website below when setting up. Please select HUMAX Time Machine Volume from the disk list when setting. Copyright © 2019 HUMAX Co., Ltd. All rights reserved.